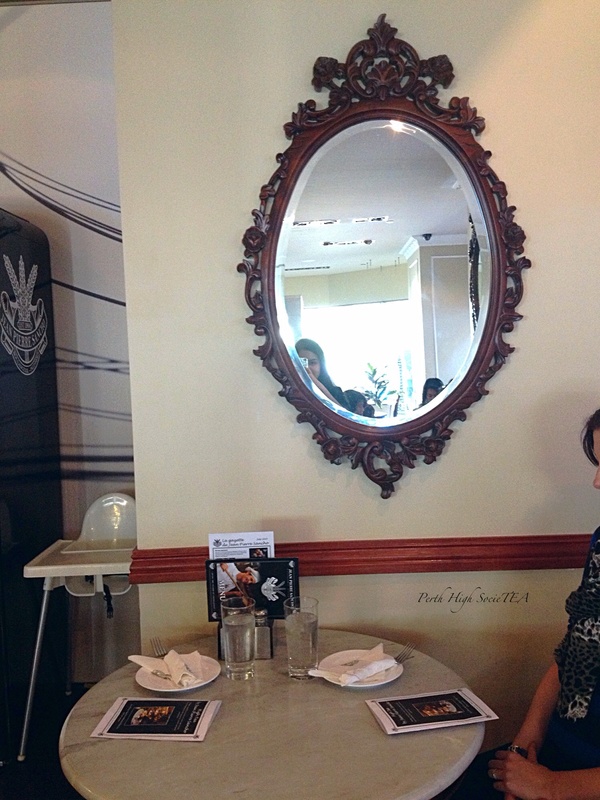 Cafe Elixir is a vibrant and busy cafe located within the city of Wanneroo. 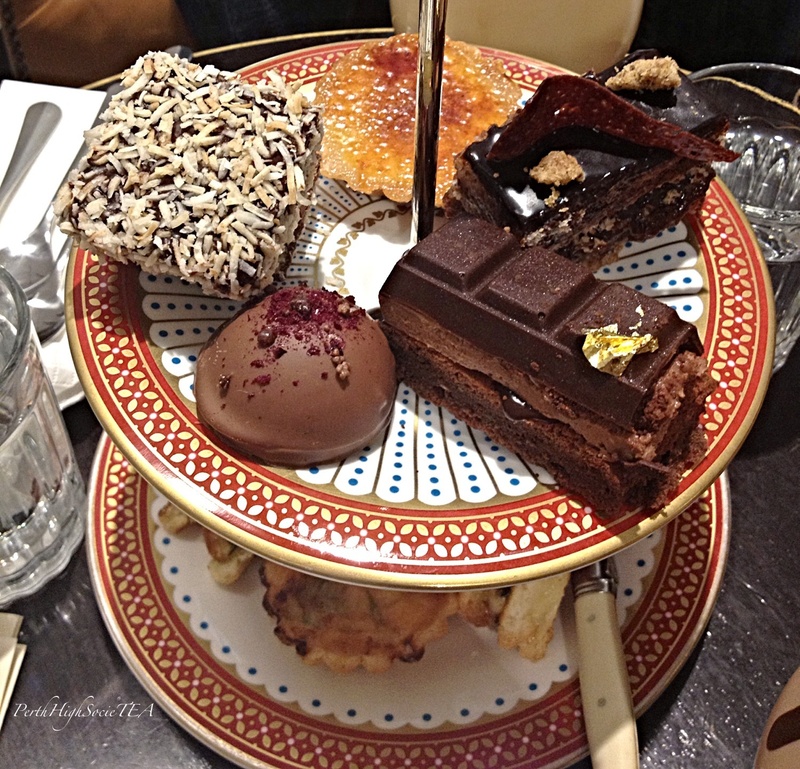 I’ve had high tea at Cafe Elixir a number of times now, and last year I held my 24th birthday party there. Going into this, I definitely knew what to expect. Cafe Elixir has a fresh and modern decor. Green, white and black are Cafe Elixir’s signature colours. The first thing I always notice when I step inside, is the fabulous wallpaper. 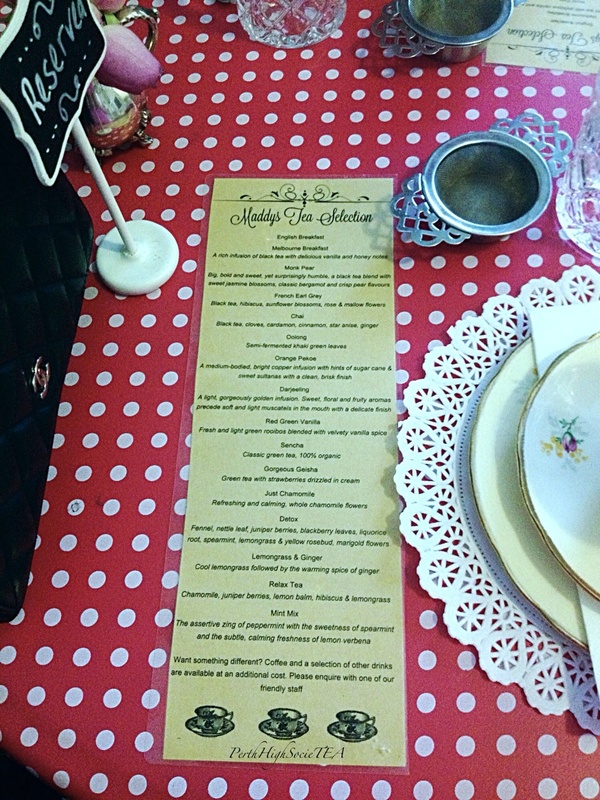 Our table featured a traditional set up and looked totally high tea fabulous. 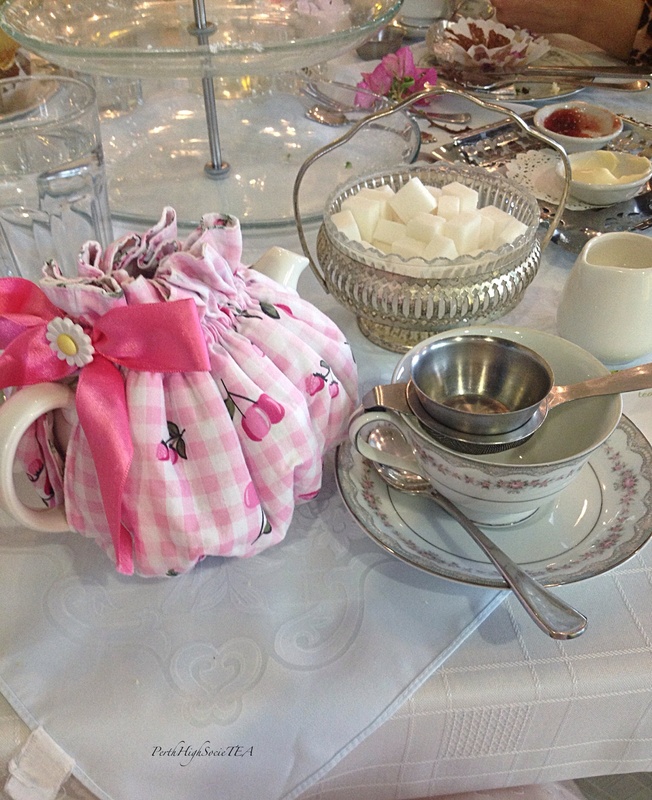 The table was adorned with a pretty white tablecloth, matching floral crockery, silver tea ware (cutlery, sugar bowls, trays) and the teapots were covered in adorable tea cosies. In the past I have had some issues with the service at Cafe Elixir. This time however, I think the service was much better. They seem to know me quite well there, and they know what to expect when I arrive for high tea. There is one girl there, (her name escapes me) and she is absolutely delightful. She is friendly, pleasant and makes you feel welcome. It’s always nice to be greeted by a friendly, familiar face when you go somewhere. The food and drinks arrived in good time, and we never encountered any problems flagging down a staff member when we needed something. What I should also mention is that Taylor, who is the owner, always goes out of his way to speak to each customer and to personalise the service. To me, this shows his dedication and enthusiasm for his business and demonstrates a strong desire to make a personal connection with his customers. I think this is what sets Cafe Elixir apart from other establishments. 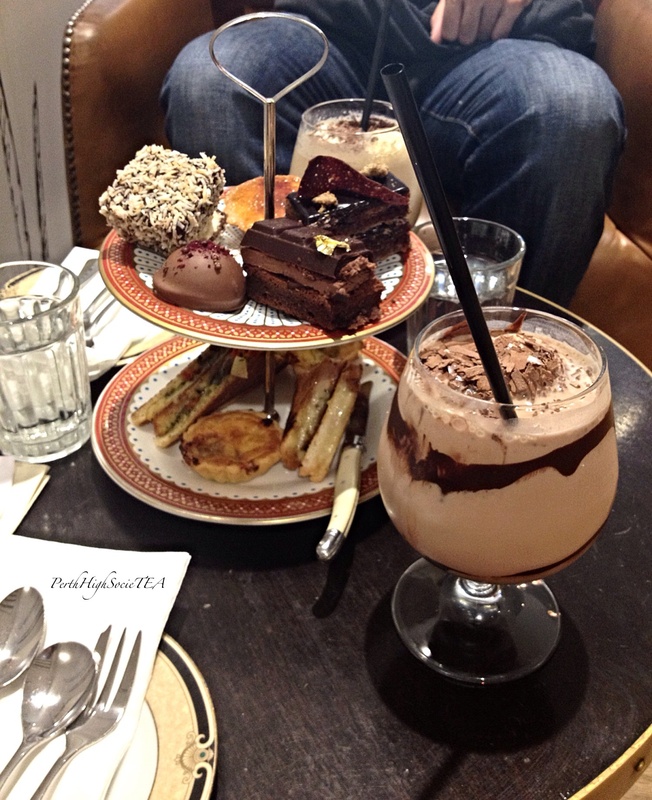 My friends and I started our high tea experience by ordering a delicious Elixir hot chocolate each. These hot chocolates are smooth, creamy and absolutely amazing. 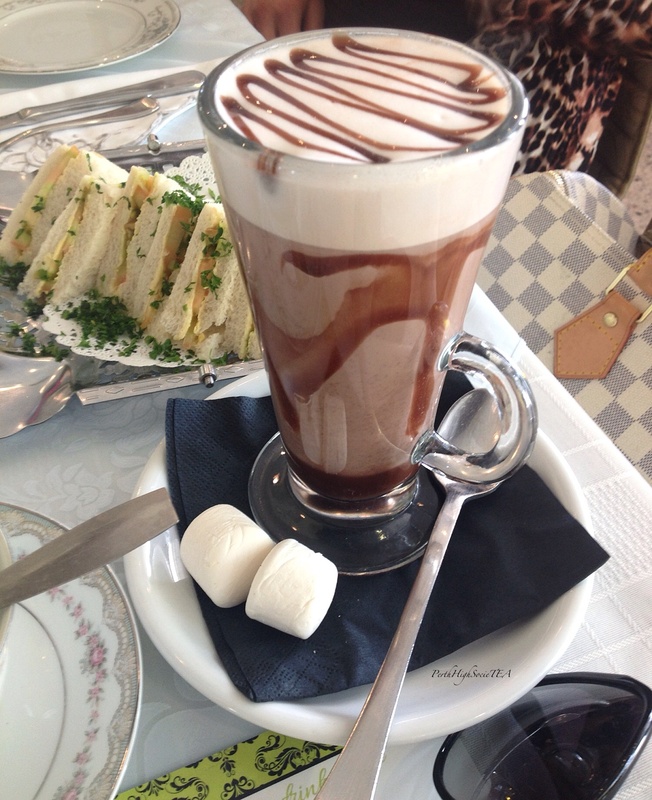 You get a choice of two drinks for high tea, so I recommend ordering a hot chocolate for one of your drinks. The next beverage of choice was good old English Breakfast. Check out those adorable tea cosies! As always, we started with the savoury goodies. First we ate the tomato sandwiches. The bread was fresh and soft, however I would have liked more variety with the fillings. Perhaps the addition of a slice of cheese or a curried egg variety. The savoury stand came out filled with a wonderful variety of vegetarian delights. The savoury stand included: mini pizzas, samosas, tomato and mushroom quiche (which was definitely my favourite, curried vegetable pasties, and spinach and ricotta rolls. My Plate of Savouries. Yum! The scones were delightful. Slightly warm, bite sized, light and fluffy on the inside and lightly dusted with icing sugar. 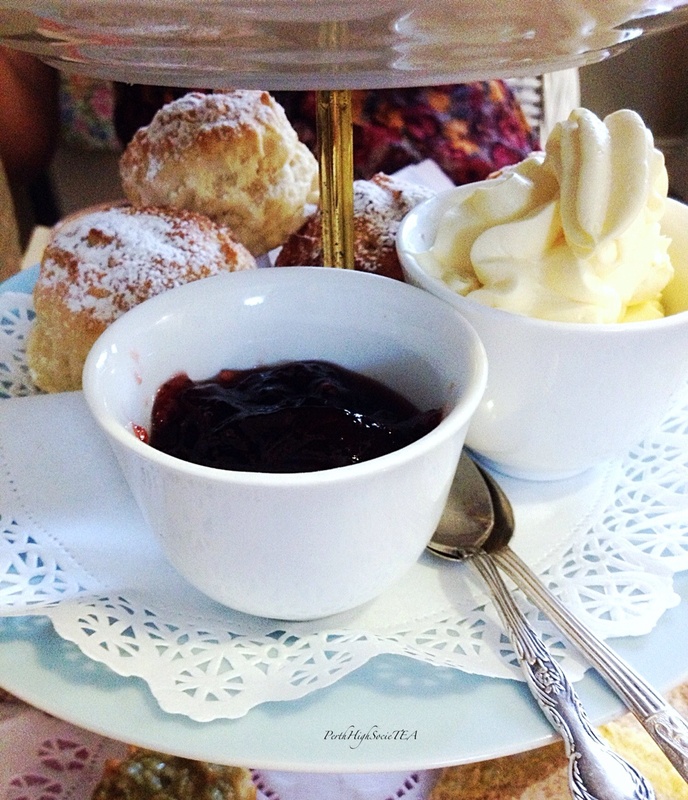 The scones were accompanied by a generous serving of strawberry jam and clotted cream. The sweets three tier included: mini vanilla cupcakes with a strawberry jam filling and pink icing, mini lemon cupcakes, petite blueberry and chocolate muffins, and scrumptious mini chocolate coated custard filled eclairs. The sweets went down a real treat with my friends. I’m unsure as to whether the food is made on-site or whether Elixir (being a relatively small cafe) outsources their high tea goodies. Irrespective of where the food comes from, every time I have visited it has always been faultless. 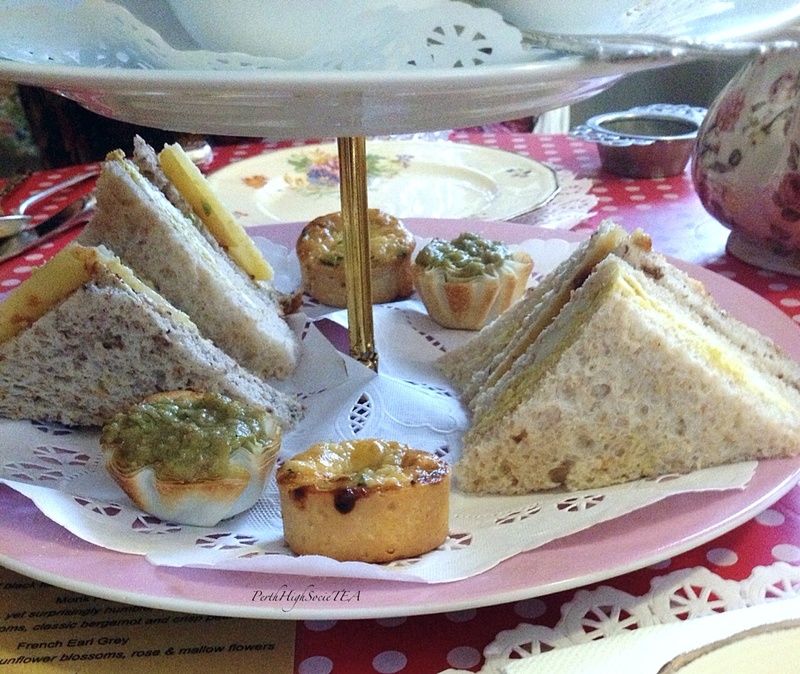 Overall, I have to say that I was happy with the high tea experience at Cafe Elixir. The venue is modern and comfortable, the ambience was nice, the service was top notch, and the food was delicious. 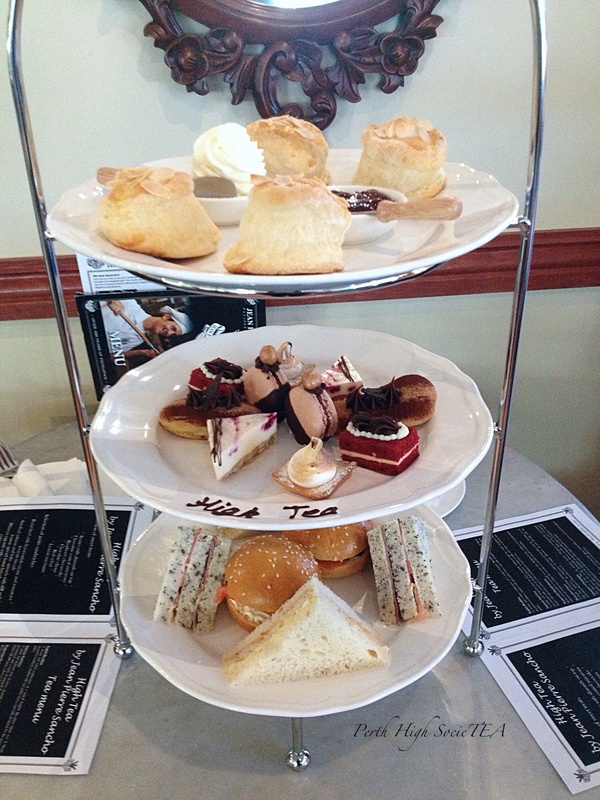 High Tea at Cafe Elixir is definitely great value for money. 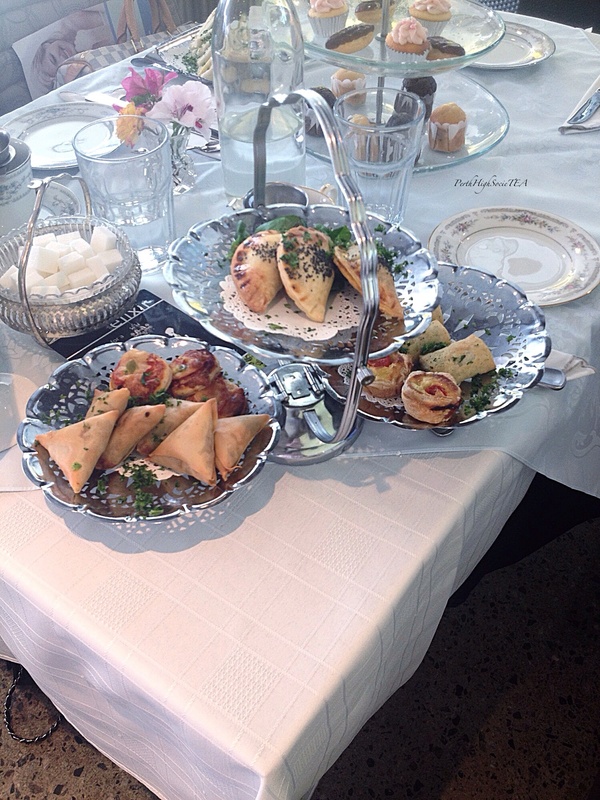 For $28 per person, you get a traditional high tea with a wide variety of food and there is plenty for everyone. Plus the hot chocolate is amazing! 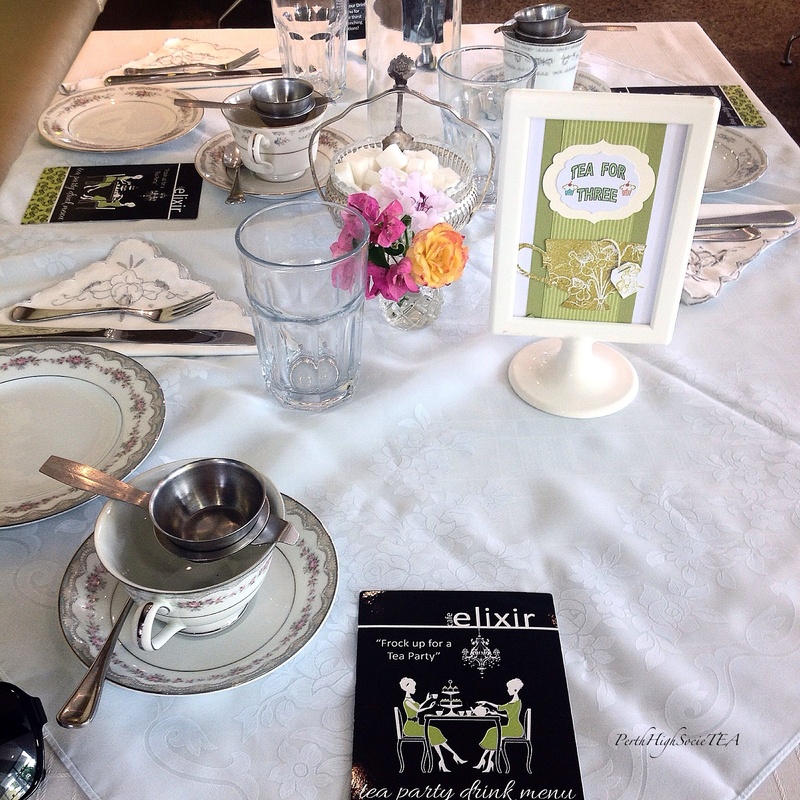 If you’re thinking of hosting a tea party, then Cafe Elixir is a good choice. There is plenty of room (they can accommodate up to 12 guests per table), it is affordable, and you get plenty of food. 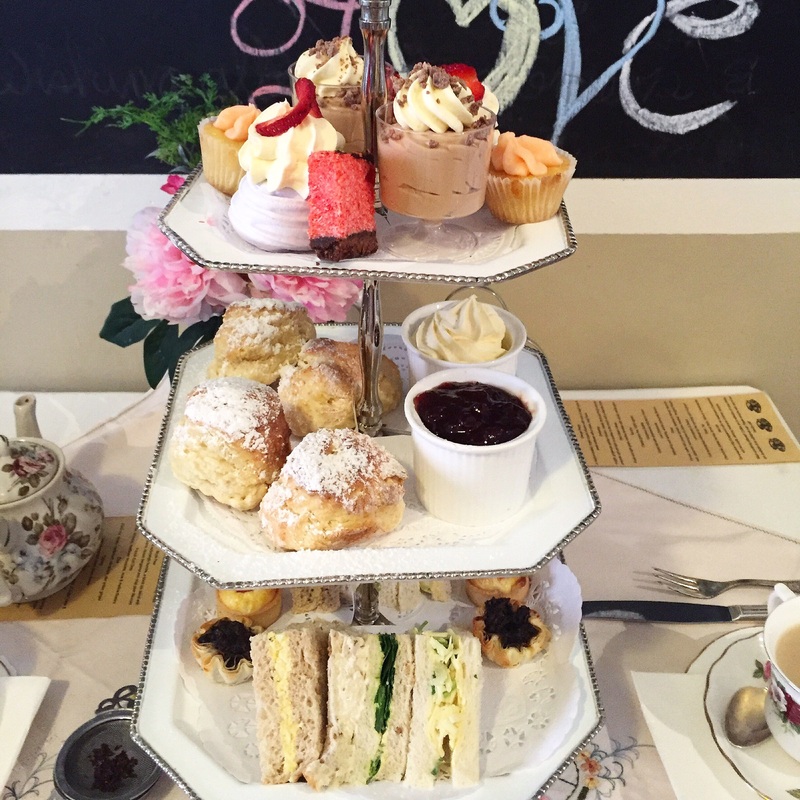 You may find that Wanneroo is a bit out of the way, however I think high tea at Cafe Elixir is definitely worth the drive. Address: 3 Rocca Way, Wanneroo. Koko Black offers a Queen of Hearts high tea for two people. You don’t expect to get a lot for around $22 per person, however you do expect to receive an ample amount of chocolate. 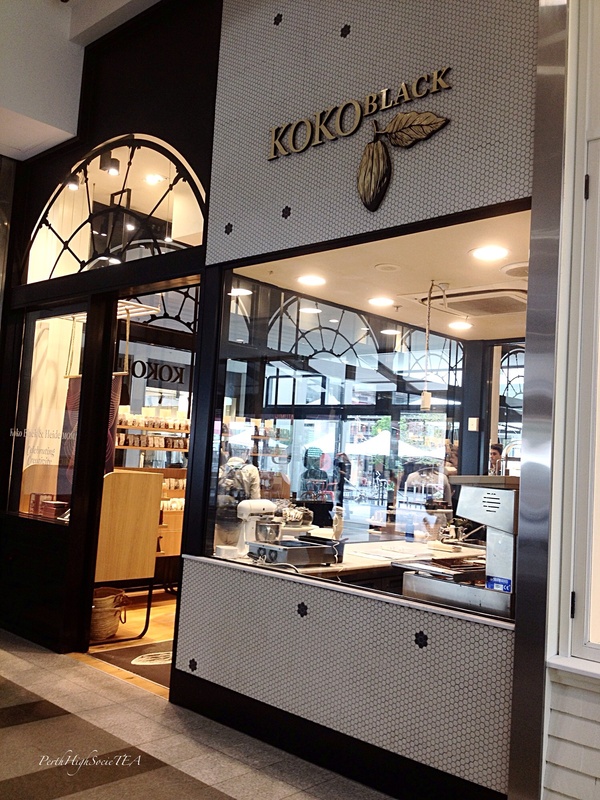 Koko Black is a stylish and modern chocolatier and cafe located inside the prestigious Claremont Quarter shopping centre. As soon as you step inside you are greeted with a strong smell of decadent chocolate and a mind boggling selection of truffles and chocolate bars. There is plenty of room, with tables inside and outside. The service was pleasant and prompt and we didn’t have to wait long for our food and drinks. I have a passion for chocolate, and not just any kind of chocolate- the kind that is of a very high quality. For drinks, instead of ordering a tea, I went for an iced chocolate and my partner ordered an iced coffee. It was definitely the best iced chocolate that I have ever tasted! 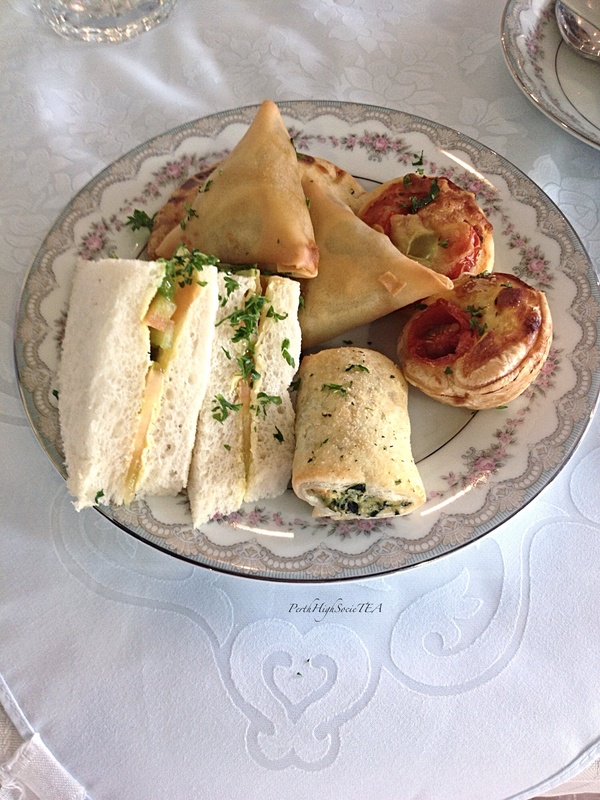 The savoury tier included a mixture of vegetarian and non vegetarian treats. 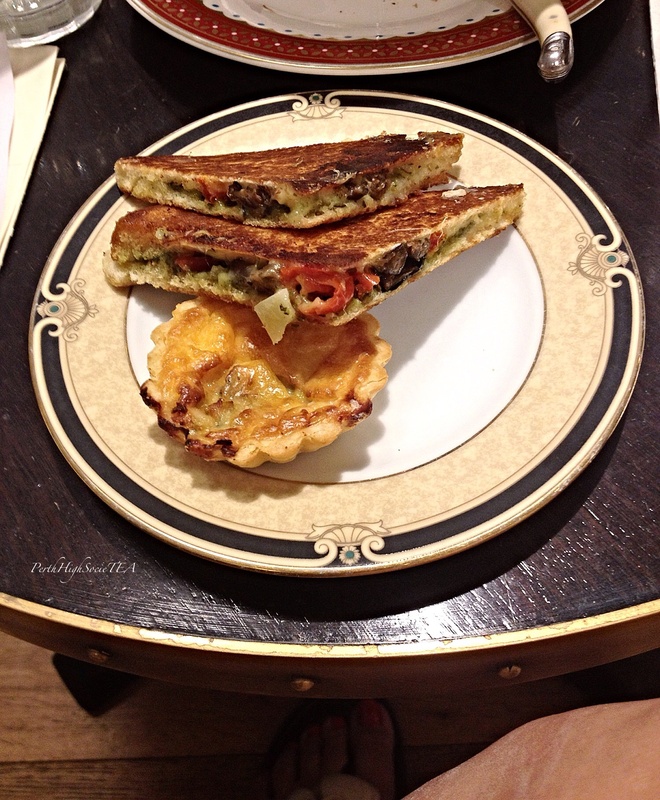 There were two leek and goats cheese tarts, a basil pesto, mozzarella, sundried tomato and roasted eggplant toasted sandwich and a pastrami, gruyere and seeded mustard butter toasted sandwich. My partner and I thoroughly enjoyed the sandwiches. I’m not a fan of goats cheese, so I didn’t particularly enjoy the tart. The sweets selection was a chocoholics fantasy which I can only describe as completely faultless. There was a cream and jam filled lamington, a koko black take on a royal biscuit, a creme brûlée tart, a rich chocolate truffle slice topped with a bar of signature Koko Black dark chocolate and a chocolate and praline cake. 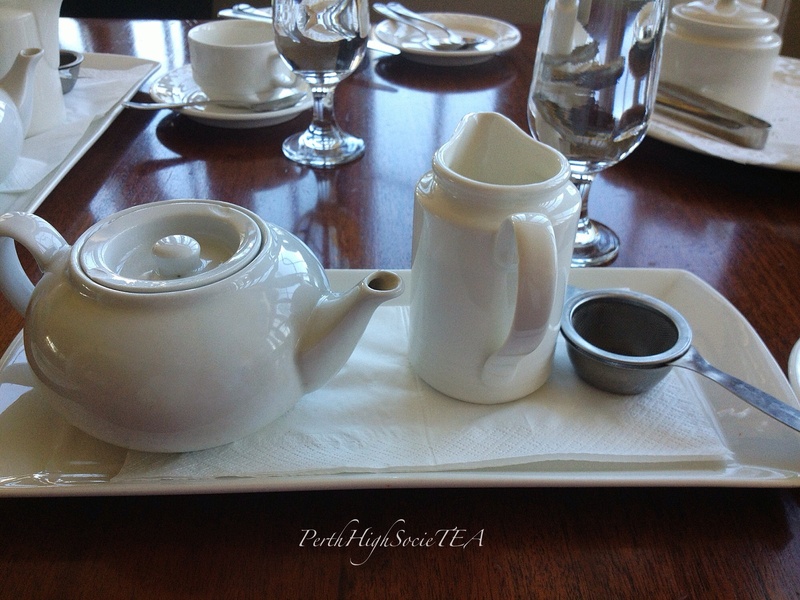 Overall, I was impressed with this high tea. It’s reasonably valued, and the food is high quality. My only suggestion would be to have lunch before you go. You don’t get a lot for $22.50 per person, and the sweets have to be shared. If you consider yourself a chocoholic, then you’re going to love this high tea. 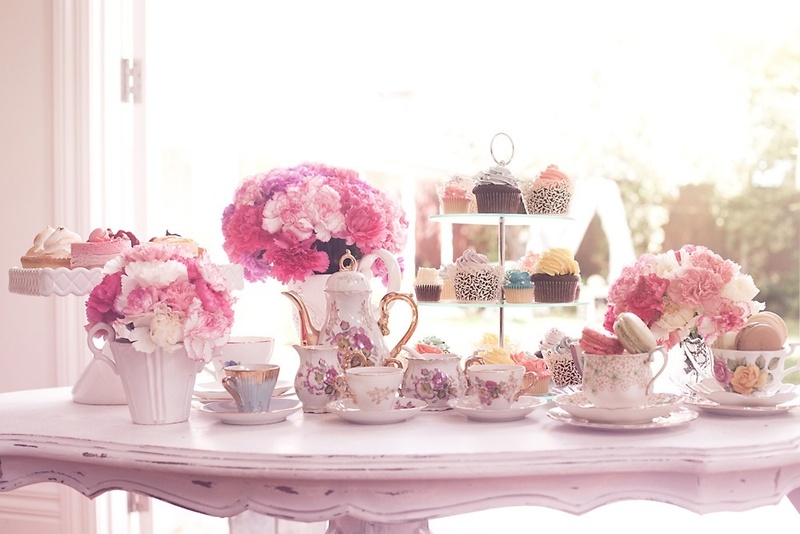 High Tea is served daily. Address: 23 Quentin Avenue, Claremont. 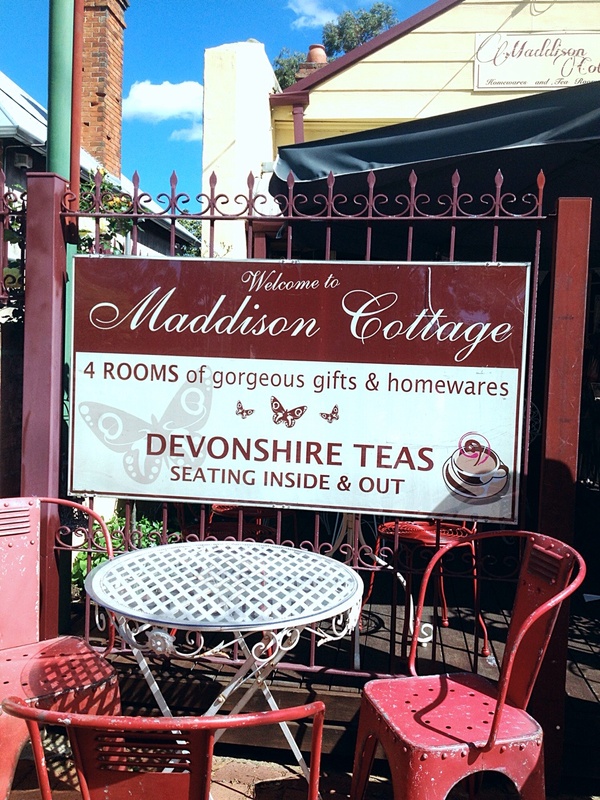 Maddison Cottage is a gorgeous little tea room nestled in the heart of historic Guidford. 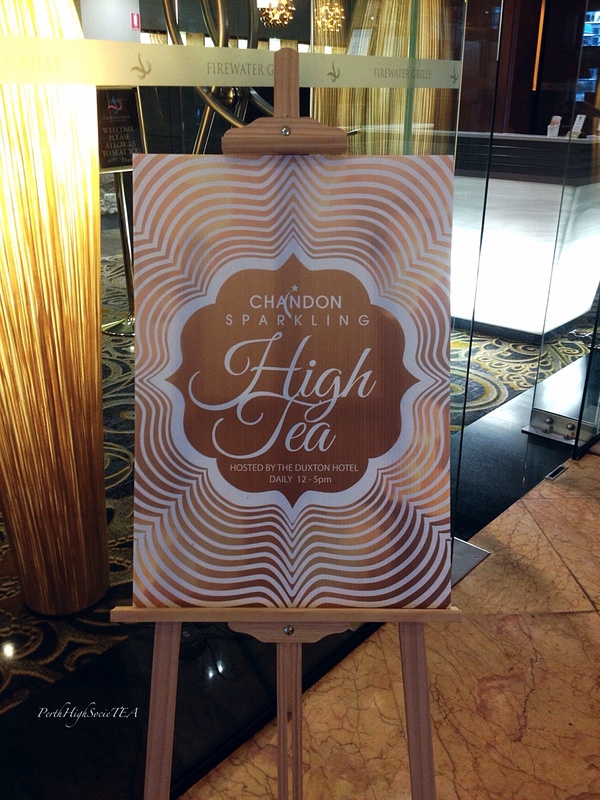 It’s the perfect place if you’re after a traditional high tea experience. Maddison Cottage is only a small venue, however what it lacks in space it makes up for with its adorable charm. 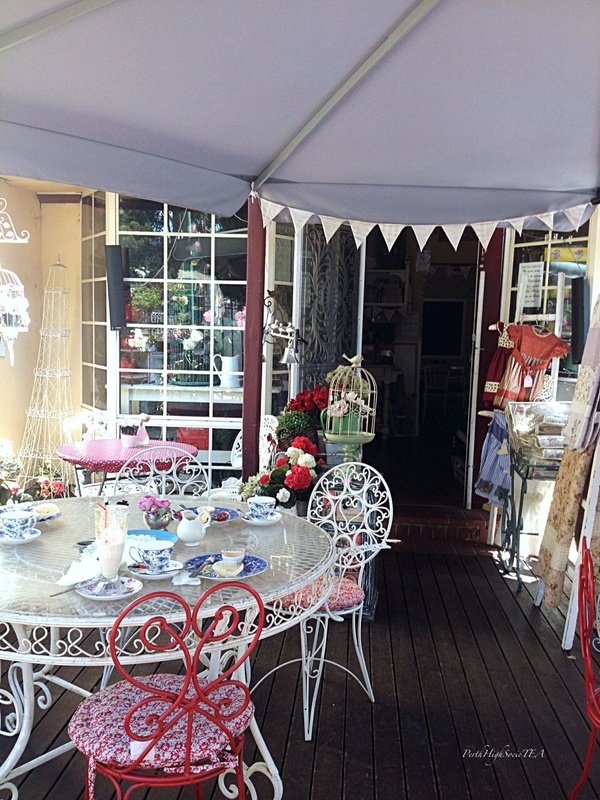 The tea room also doubles as a shop, filled with beautiful tea ware, jams and preserves, and gorgeous knick-knacks. Our table looked absolutely gorgeous. 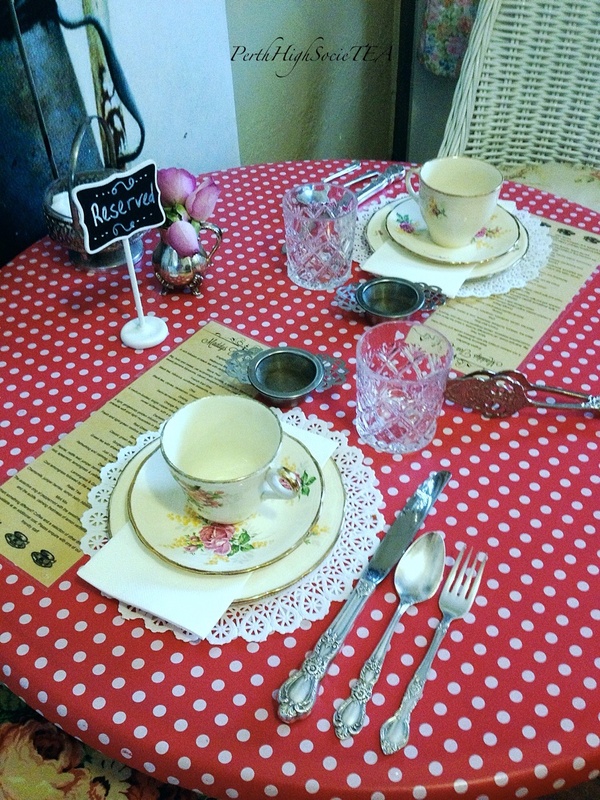 It was adorned with traditional floral tea ware, elegant cutlery, and a cute poker dot tablecloth. It’s been a long time since I last experienced a proper and traditional high tea like this, and it’s places like Maddison Cottage that can really execute an authentic high tea experience. The service was faultless. My friend and I had the privilege of meeting the owner, a lovely mother, along with her beautiful daughter and adorable granddaughter. Now this is what I call service! It’s lovely to see owners get around and introduce themselves, and it adds a personalised and memorable touch to the culinary experience. Being so close to my own mother, it was really nice to see another mother and daughter working so closely together. The staff at Maddison Cottage were wonderful. My friend and I were offered endless refills of tea, and staff were attentive and obliging. I couldn’t have asked for better service! Maddison Cottage offers an extensive range of T2 teas. I enjoyed a pot of English Breakfast and a pot of Melbourne Breakfast. Melbourne Breakfast is a black tea with vanilla and honey notes. The honey is definitely the most dominant flavour in this tea. And out came the three tier stand! My first remark to my friend was “how do they know that pink is my favourite colour?” After a few quick photos, we dived straight in. The savoury tier was delicious. We had a vegetarian selection of sandwiches which included two varieties: curried egg which is always my favourite, and chutney and cheese. We also received a couple of savoury tarts each (Hooray! ), a sundried tomato with cheese tart which was amazing, and a mushroom tart. 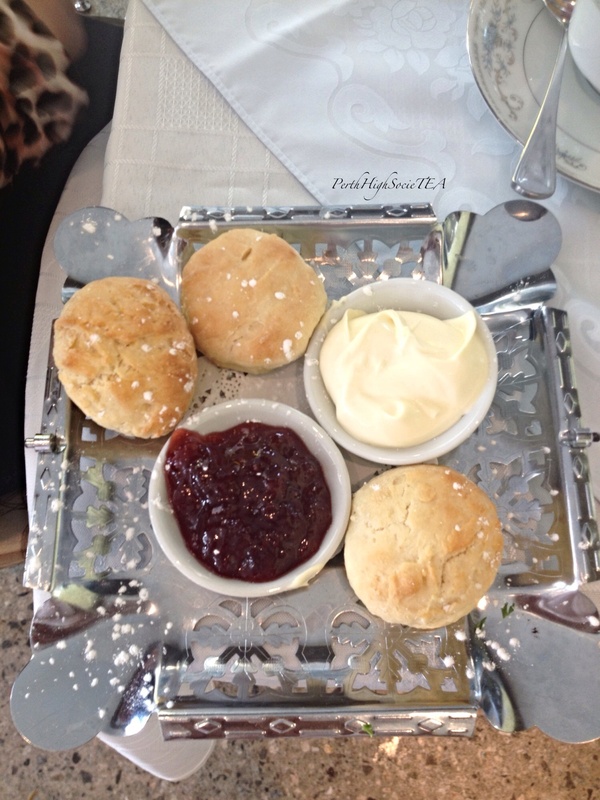 The plain scones were incredible. Warm, fresh, light and fluffy- exactly how they should be. 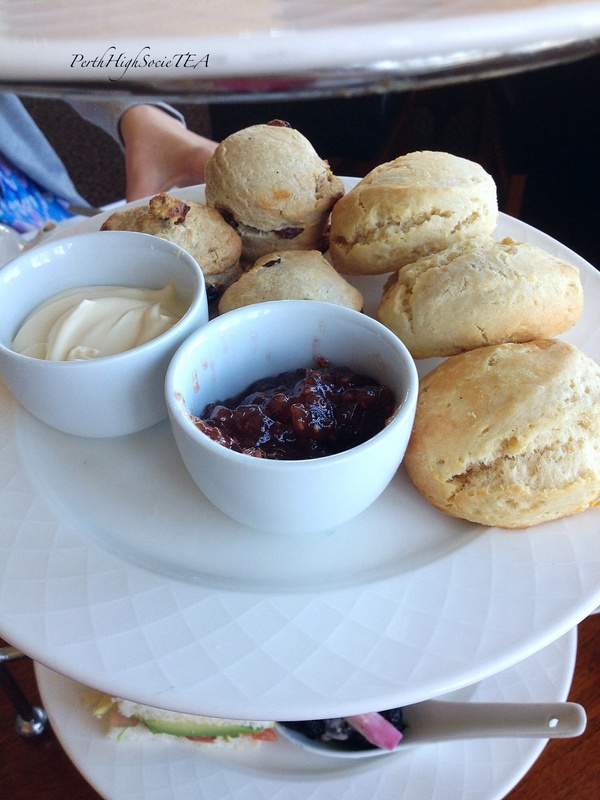 My friend and I received two medium sizes scones each, with a side of strawberry jam and clotted cream. The sweets were remarkable. Not only did they look gorgeous but they tasted delicious too. The selection included: a pink cupcake- yum!, a pink meringue with fresh cream and strawberries (this was my favourite), a coconut and lime slice, and raspberry mousse topped with fresh cream and a raspberry. It was a fresh and fruity selection of sweets. 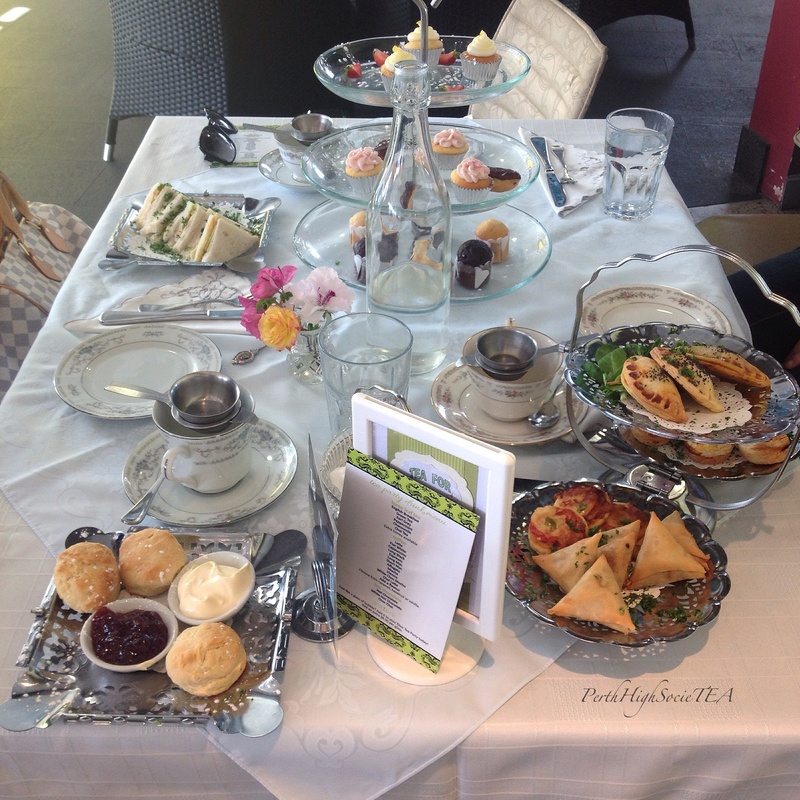 Everything about this high tea experience was perfect. The venue is delightful, the service was impeccable, the food was mouthwatering, and the owners are lovely. It was a relaxing and very memorable experience. It wasn’t overly busy, so my friend and I were able to chat freely. The instrumental music playing softly in the background reminded me of my trip to Paris back in June. For me, Maddison Cottage ticked all the boxes. 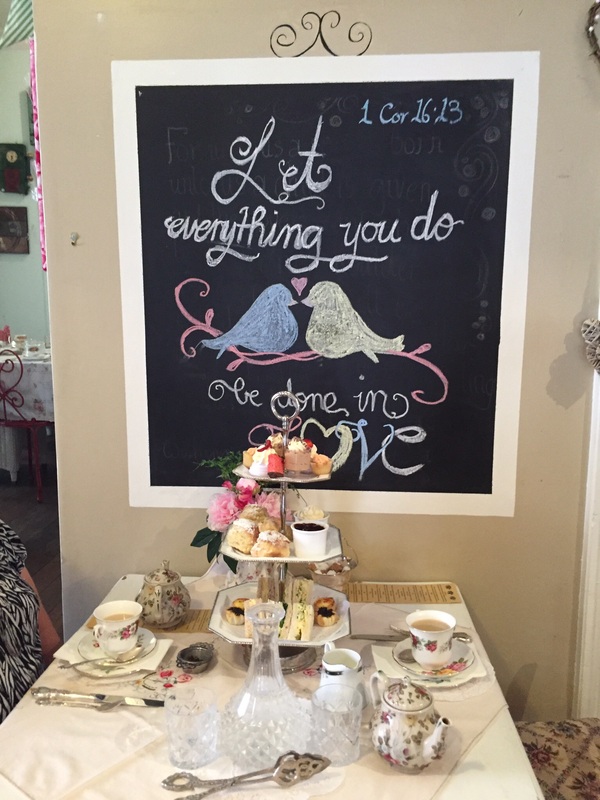 If you are after a high tea experience that is set in a traditional venue, offers personalised service, and has a delicious selection of mouthwatering treats, then Maddison Cottage is the place for you. Visited Maddison Cottage on the 8th of October 2015 with my mother. The experience was much the same as last time. Wonderful prompt and friendly service, adorable location, tables adorned with mismatched crockery, and a selection of beautiful fresh and delicious food. The scones were a hit with my mum, as were the savoury mushroom tarts. 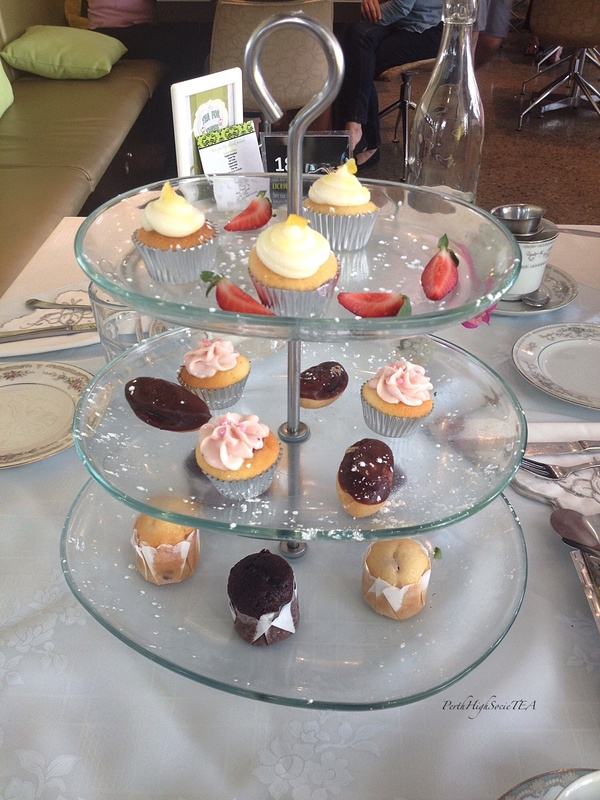 I enjoyed the mint chocolate mousse, the cherry ripe slice and the gorgeous petite cupcake. The sandwich fillings included, egg, pineapple with cheese and spring onion, and chicken. Due to the variety of strong flavours in the savoury selection, I suggested to the owner that she consider offering guests a palette cleanser before they begin devouring their scones. There was a large variety of teas to choose from, and my mother and I were offered unlimited pots of tea, which was fantastic. 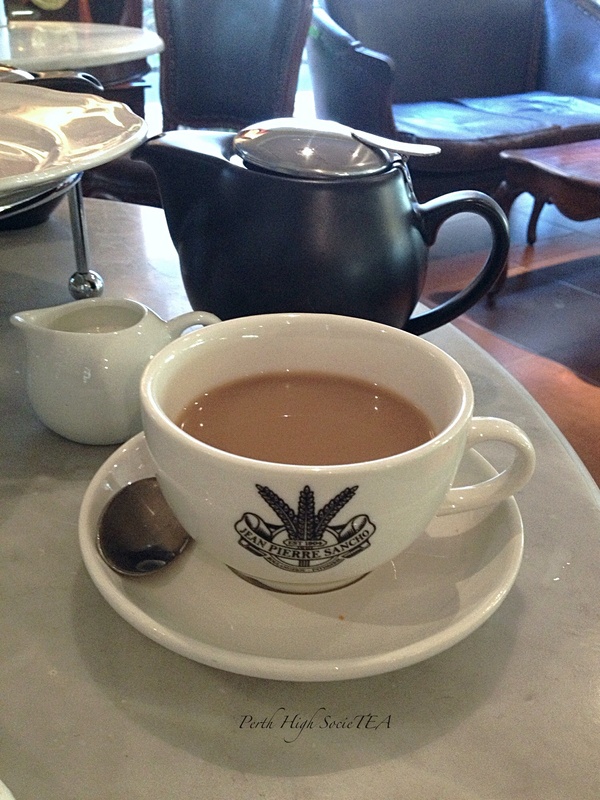 I had a pot of the T2 Melbourne Breakfast and a pot of the Darjeeling. 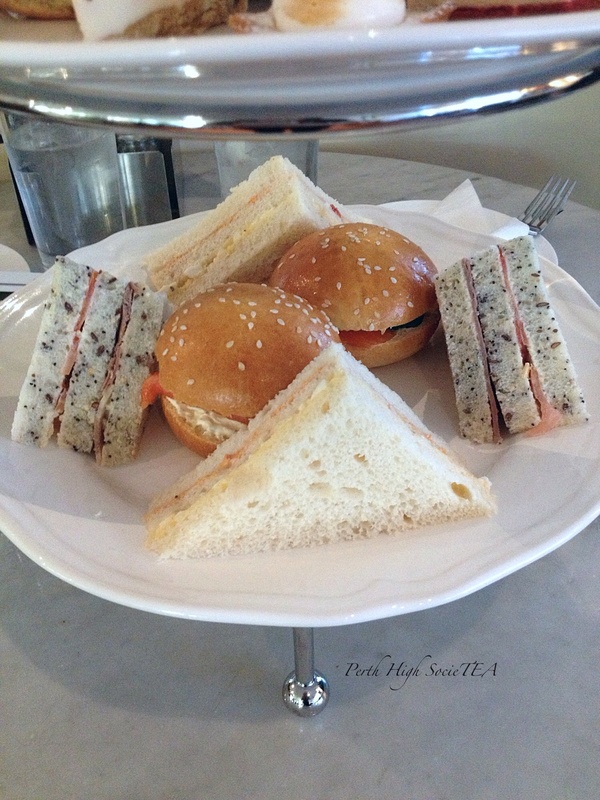 High Tea is served Tuesday to Friday and booking hours are flexible. 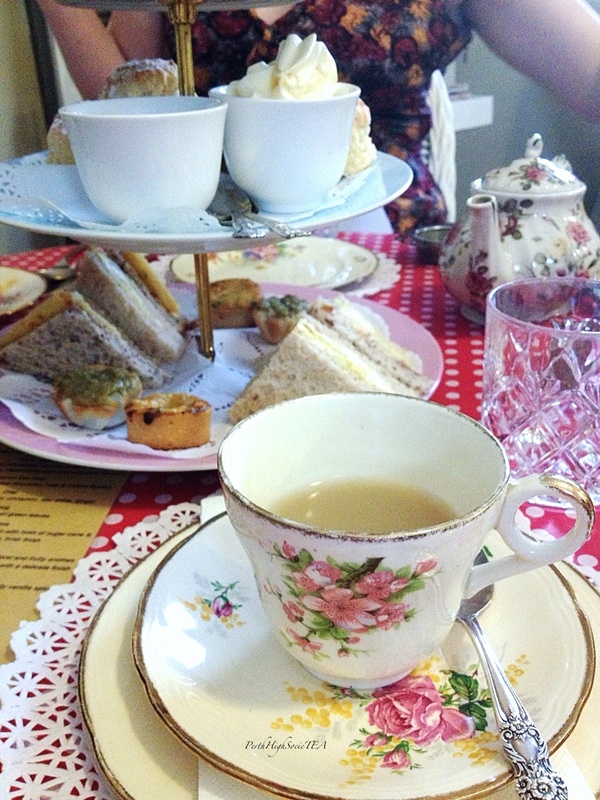 High Tea is also served Saturday and Sunday with sittings at 10am, 1pm, 1:30pm and 2pm. Address: 145 James Street, Guildford. 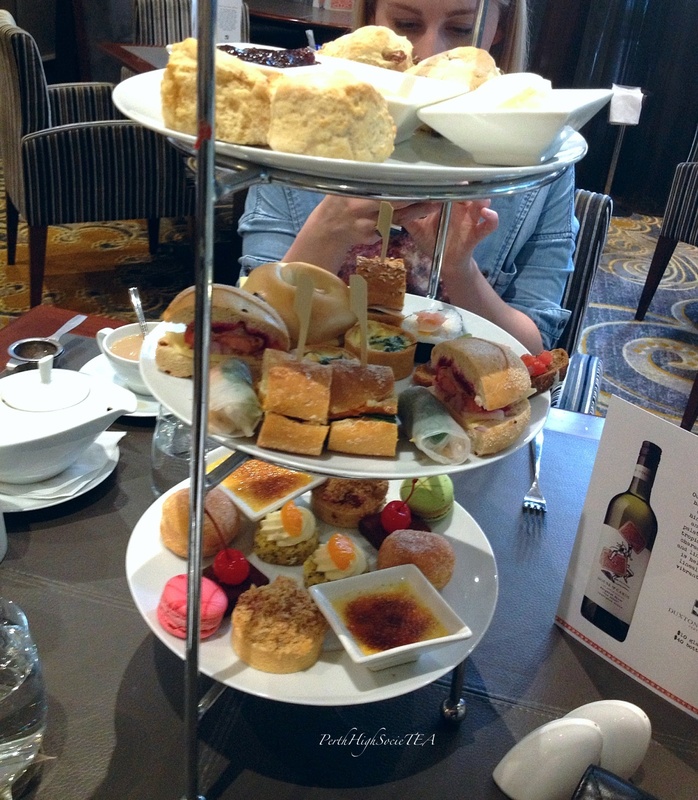 Today my friend and I visited the the Duxton Hotel in Perth’s CBD for high tea. 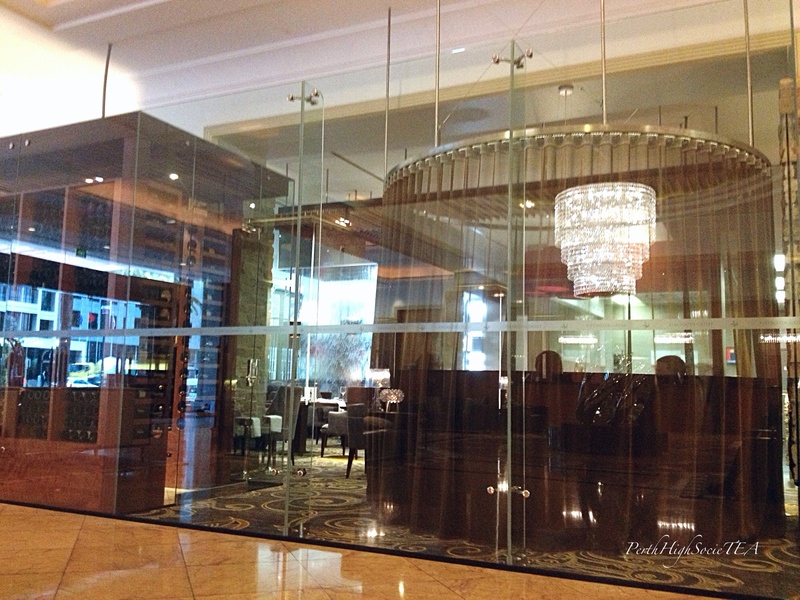 High tea is served at the stunning Firewater Grille restaurant, which is located just inside the lobby area. The Duxton Hotel is one of Perth’s few five-star hotels, offering high quality accommodation and dining experiences. The Duxton Hotel is a beautiful and luxurious five-star hotel. I’m not going to go into too much detail about the venue, because I believe that the photos speak for themselves. Just look at that chandelier! 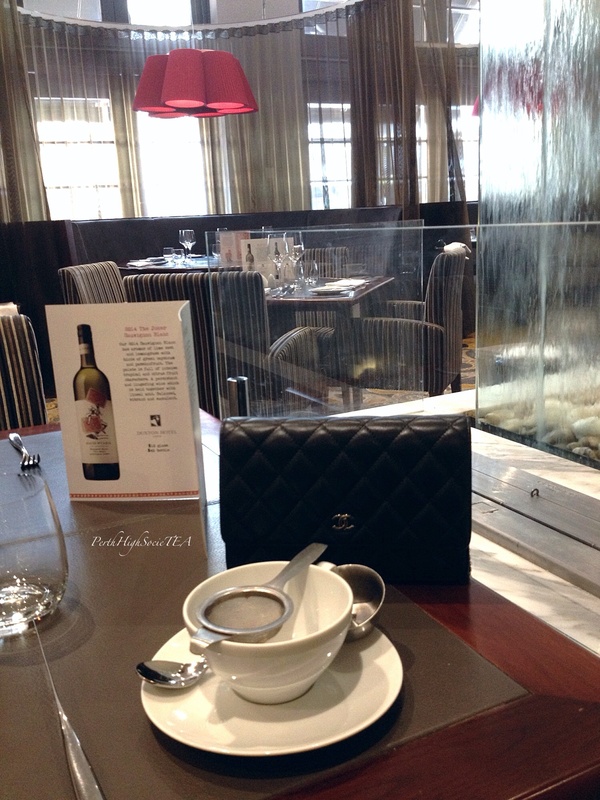 Our table was adorned with simple white tea ware that suited the modern and sophisticated decor of the restaurant. 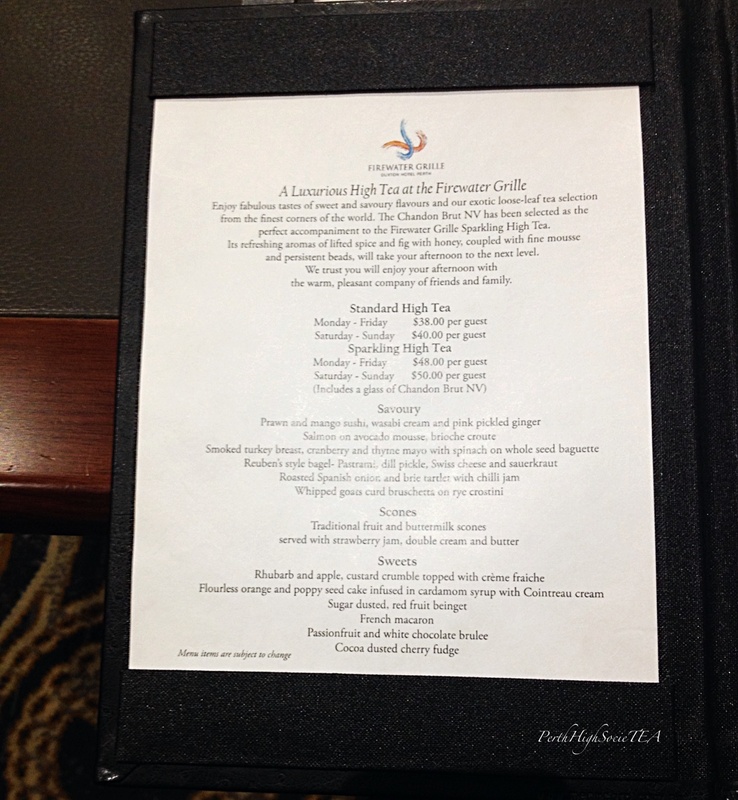 The service we received at Firewater Grille was nothing short of what you would expect from a five-star hotel. 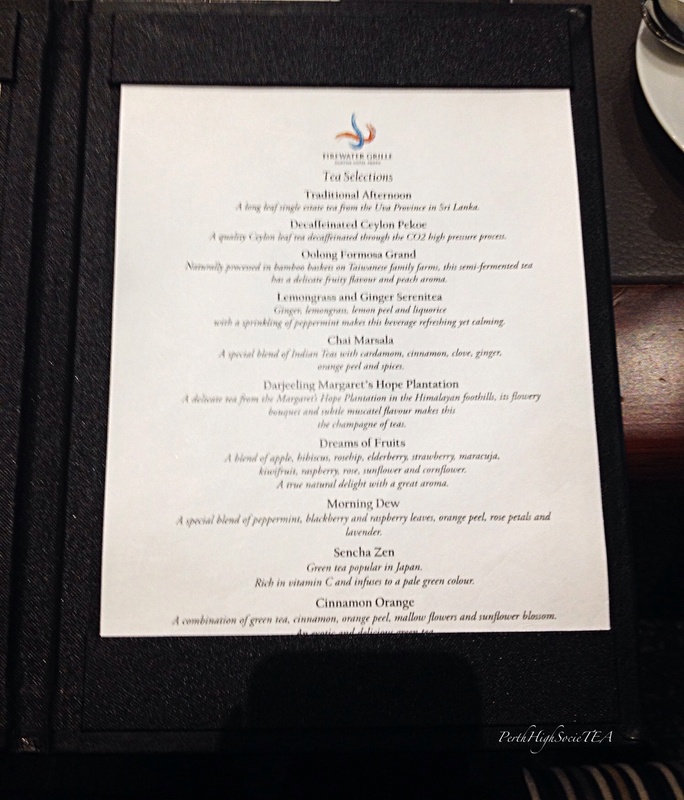 When we arrived at the restaurant, a hostess took us to our table and handed us a high tea menu each. After taking some time to decide which tea we wanted, the hostess took our order, and quickly returned with our tea and three-tier stand. Our tea was poured for us, which was wonderful, and the hostess seemed pleasant enough. I should also mention that there were no issues when it came to accommodating my dietary requirements. I selected the ‘Dreams of Fruit’ tea, which was a pleasant blend of fruits with a gorgeous sweet aroma. It actually reminded me of strawberry jelly. 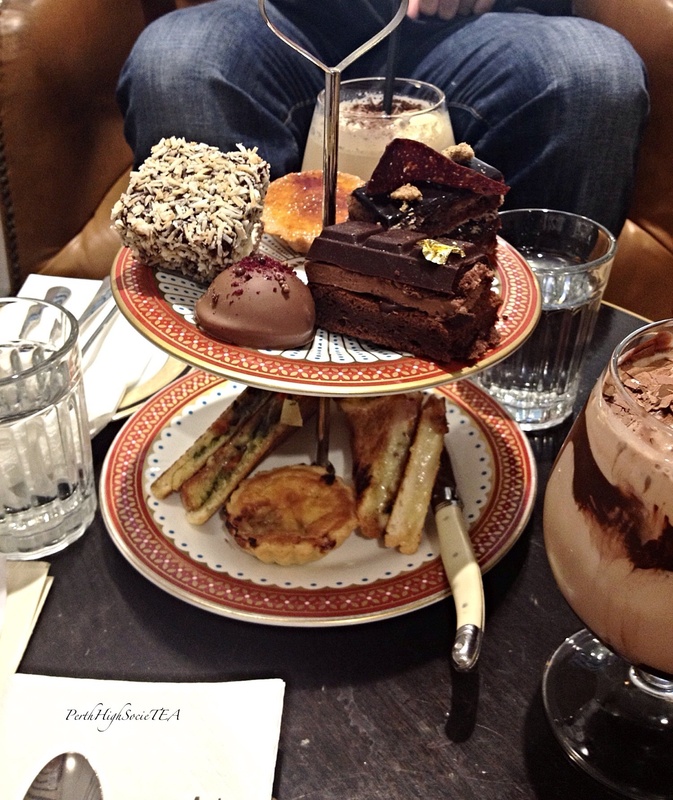 Being such a refined high tea menu, my friend decided to stay safe and simple with the ‘Traditional Afternoon’ tea. The three-tier stand arrived overflowing with an array of sweet and savoury treats. 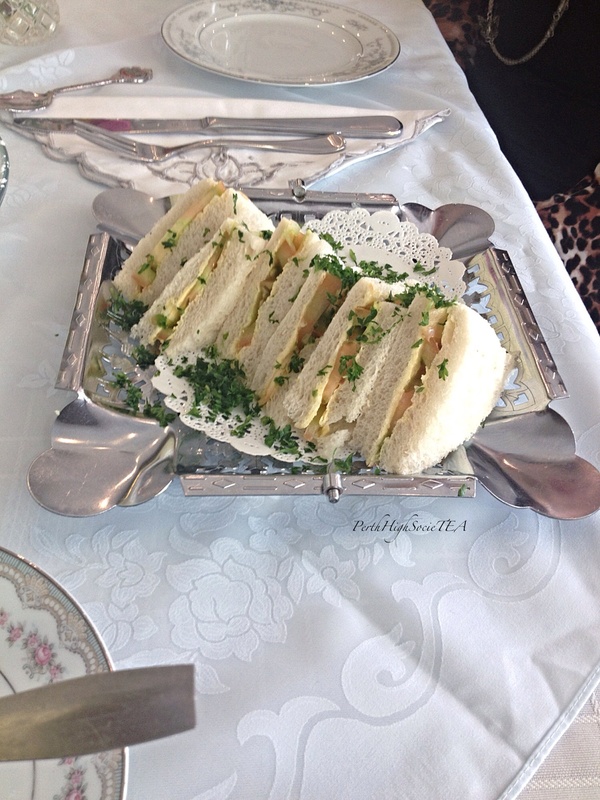 The food looked very refined and was certainly a twist on a traditional high tea menu. The savoury tier was by far my favourite. My vegetarian selection included: two delicious pumpkin and cream cheese baguettes, two salad with cheese brioche, a roasted spanish onion and brie tart, a tomato bruschetta, and two salad filled rice paper rolls. My friend’s selection included: prawn and mango sushi, salmon on avocado mousse brioche, a smoked turkey breast, cranberry and thyme mayo with spinach baguette, goats curd bruschetta, a Swiss cheese, dill pickle and pastrami bagel, and a roasted spanish onion and brie tart. Judging by the look of satisfaction on my friend’s face and her squeals of delight, I think I can safely say that she enjoyed her selection! My friend and I received two fruit and two plain scones each, accompanied by strawberry jam, clotted cream and for the first time ever, butter! The scones were a good size, not too big and not too small. They were soft on the inside and had a nice freshly baked crunch on the outside. However, I feel that they could have been a tad more generous with the jam and cream. As you can see, there was no shortage of sweet delights. My friend and I tucked into the passionfruit creme brûlée first, and thoroughly enjoyed it. Other treats included a rich chocolate cherry fudge, traditional macarons, orange and poppy seed cake, rhubarb, apple and custard crumble, and a fruit beinget, which reminded me of a jam donut (minus the jam). The restaurant itself was very quiet, and there weren’t many people in there. I think my friend and I were the only ones having high tea. This made for a rather peaceful experience. 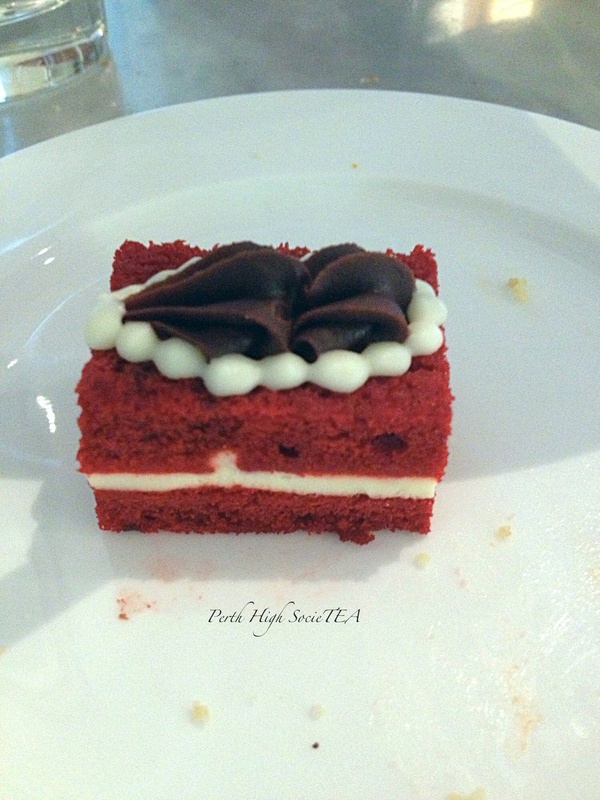 Overall, I have to say that I was pleasantly surprised by high tea at the Duxton Hotel. The venue is sophisticated and modern, the service was top-notch, and the food was fresh with a unique twist. The Duxton Hotel is one of the pricier places that offers high tea, however, if you are after a good enough reason to get dressed up and treat yourself, then this is the place for you. You get an ample amount of high quality food, so it works out to be great value for money. 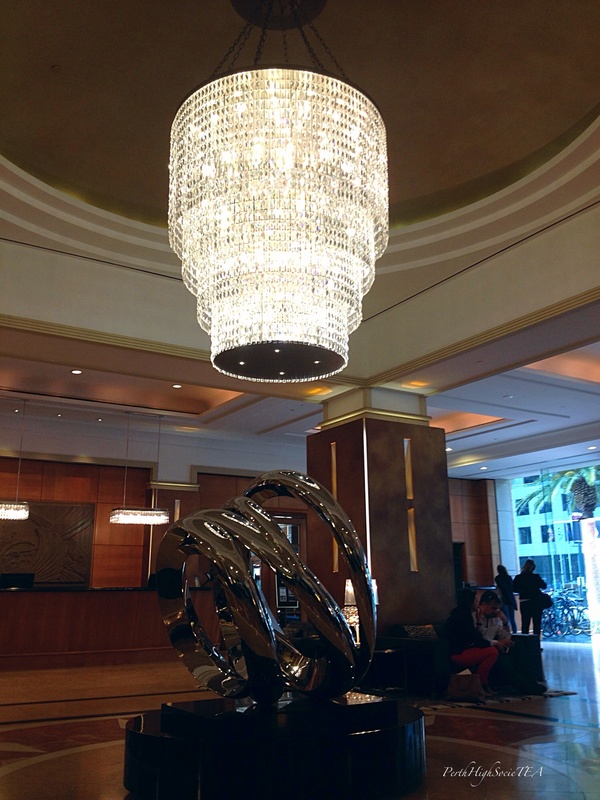 Address: 1 St Georges Terrace, Perth. 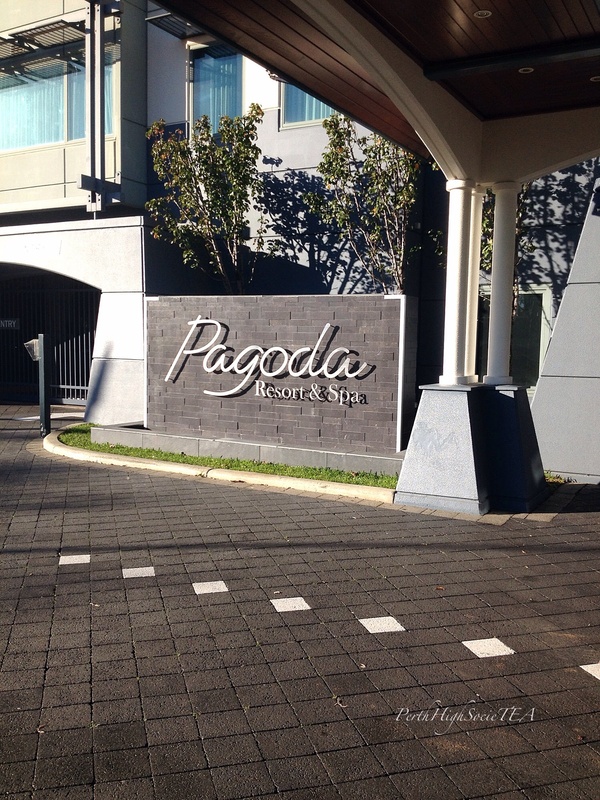 I have known about the high tea at Pagoda for some time now, however it was the low Urbanspoon rating that had kept me away. After putting it off for so long I finally decided to give it a go. After all, sometimes you just need to give a place the benefit of the doubt, and I simply cannot recommend a venue that I have not been to. The Pagoda Resort & Spa is quite an old looking establishment. It is however, situated on prime real estate on Melville Parade in South Perth, which overlooks the Swan River. Being the only ones there, my friend and I were able to get a window seat. 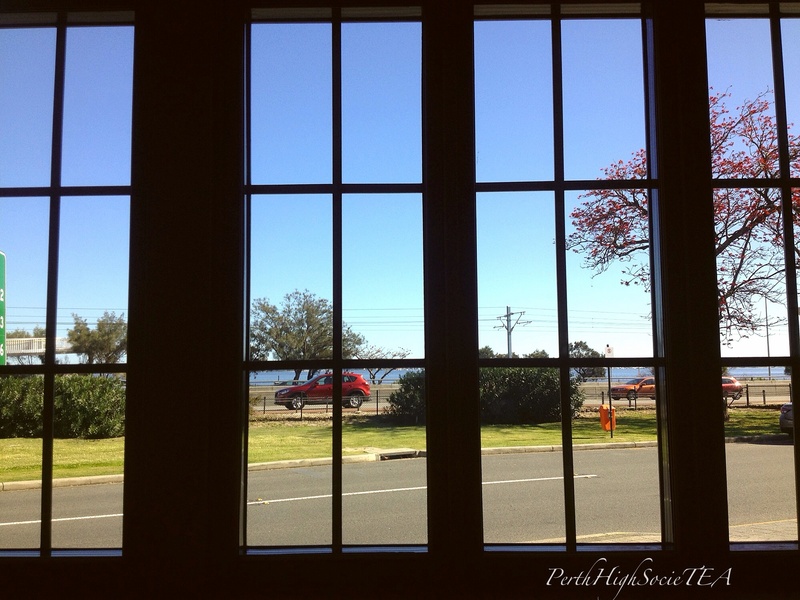 It’s not a bad view of the swan river, however I found that the Kwinana Freeway really obstructs the view. 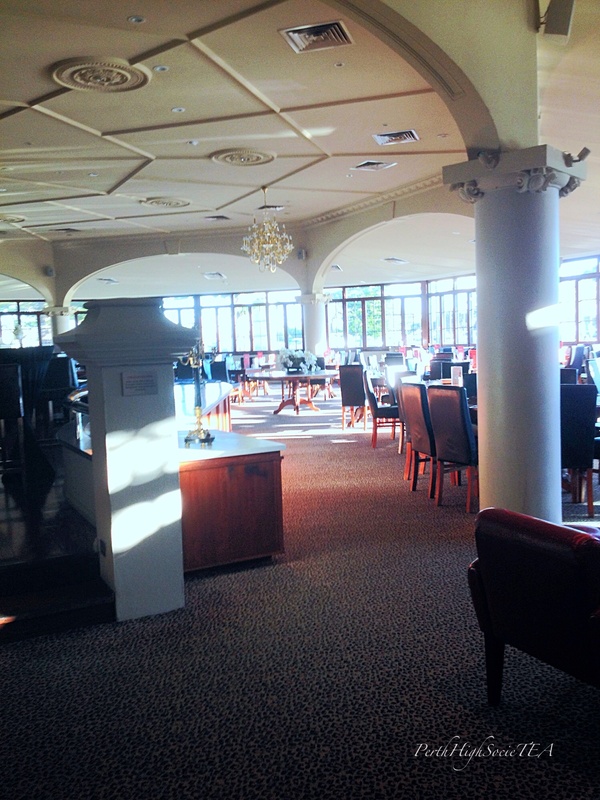 Although it looks rather outdated, the Restaurant & Bar area is very spacious, and it has an elegant charm. However, I definitely think they could spend some money on renovations. Our table was very simple. White tea ware, and white napkins. Nothing really that unique or special. We received very attentive service at Pagoda, which was probably due to the fact that we were the only ones there! When we arrived, we were greeted by the manager. He directed us to our seats and very promptly took our tea orders. 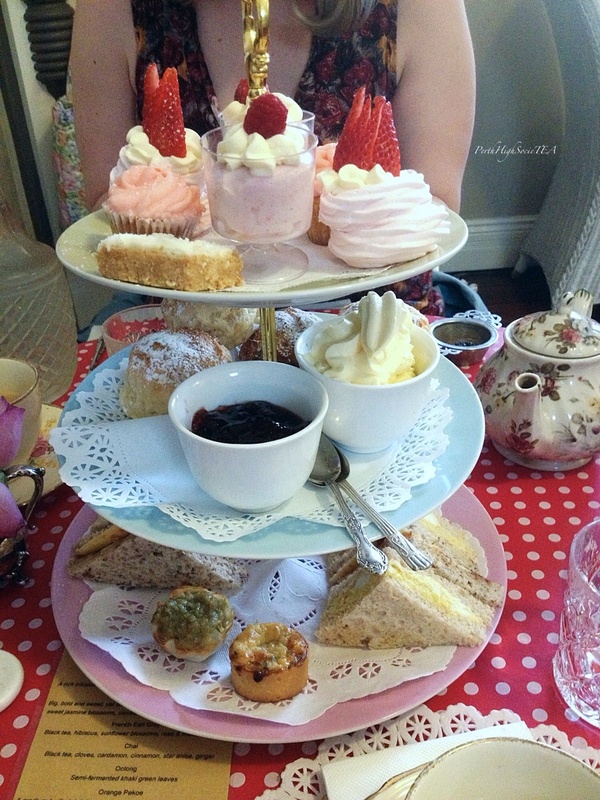 We didn’t have long to wait for our tea, and our three tier arrived shortly after. During our sitting, a hostess came over numerous times to check if we needed a tea refill. I was impressed with this, especially as most venues only offer one pot of tea per person. It should also be noted that staff remembered our dietary requirements. This is always a plus. For tea, I ordered English Breakfast, and my friend ordered Chai. A very colourful and impressive looking three tier. 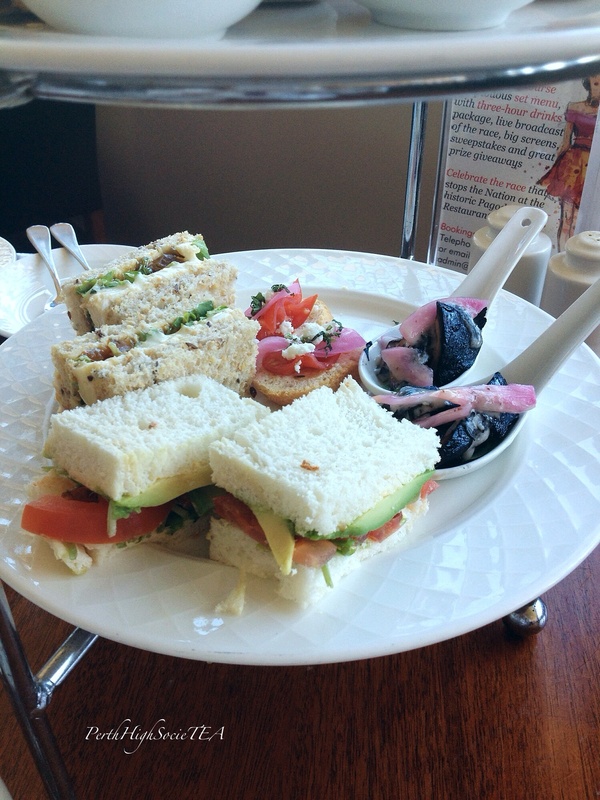 On the savoury tier, we received two varieties of finger sandwiches: relish with Camembert and avocado with tomato. We also received a spoon containing mushrooms, red onions and a balsamic dressing. My friend didn’t particularly enjoy this, and to be honest it looked so unappealing that I wasn’t game enough to try it. What I did enjoy was the crostini with a fresh tomato and feta topping. I would have preferred more traditional sandwich fillings. It’s like I always say, sometimes it’s better to keep it simple. My friend and I received three decent sized scones each, with strawberry jam and clotted cream. There were two varieties: plain and fruit with a hint of cinnamon. I can only ever fit one in, so I decided to half both varieties just to try them. I preferred the plain scone, as I am not a fan of cinnamon. The scones were quite nice, still warm, very buttery and light on the inside. Unfortunately I can’t say that I enjoyed the sweets tier. There wasn’t anything that stood out as particularly nice, but that’s just my opinion. The sweets tier included: citrus macarons, lemon and poppyseed cake, egg custard tarts, and a berry and custard dessert. Being the only ones in the entire restaurant made for a very peaceful experience. I felt like a celebrity who had reserved the entire venue for myself. 🙂 Although the price of high tea is reasonable, I wasn’t particularly impressed with the food. This is arguably the most important factor when reviewing a high tea experience, and based on this, I wouldn’t recommend Pagoda for high tea. There are better places to go. My good friend is currently in town for the school holidays. 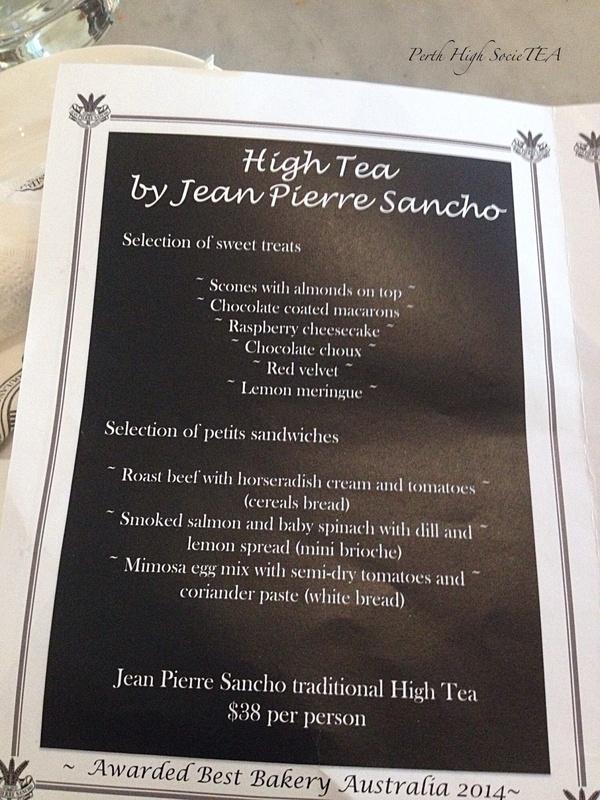 Recently, she discovered that the popular French bakery Jean Pierre Sancho has started offering high tea at their Hay Street location. Thinking that this might be a nice experience, she decided to make a high tea reservation for us for a Thursday afternoon sitting. I was excited to try it, yet nervous at the same time. 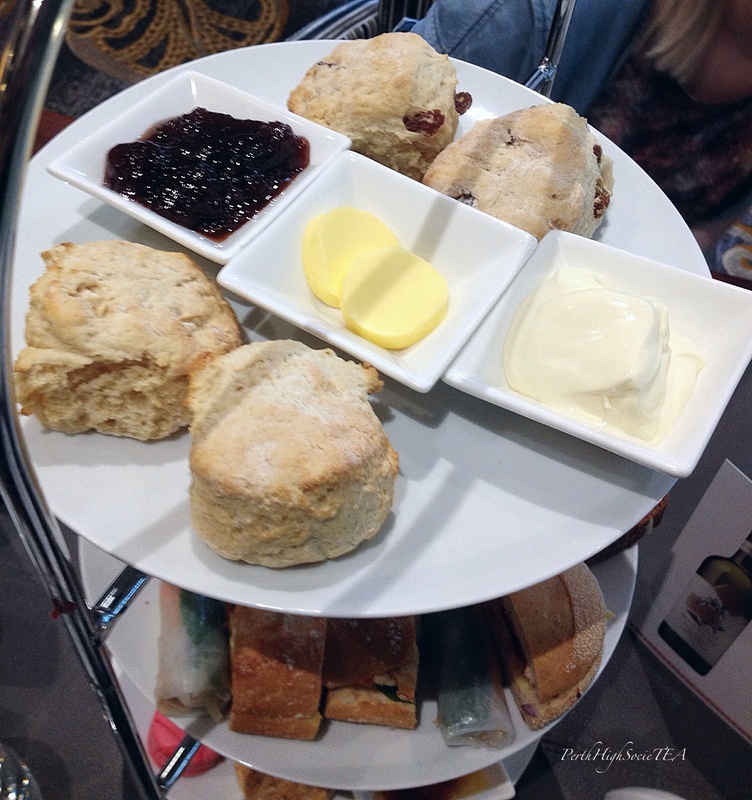 I have recently returned from the United Kingdom aka the land of afternoon tea, and I thought that there was no way that high tea in Perth could ever compare to London. Turns out that I was wrong! 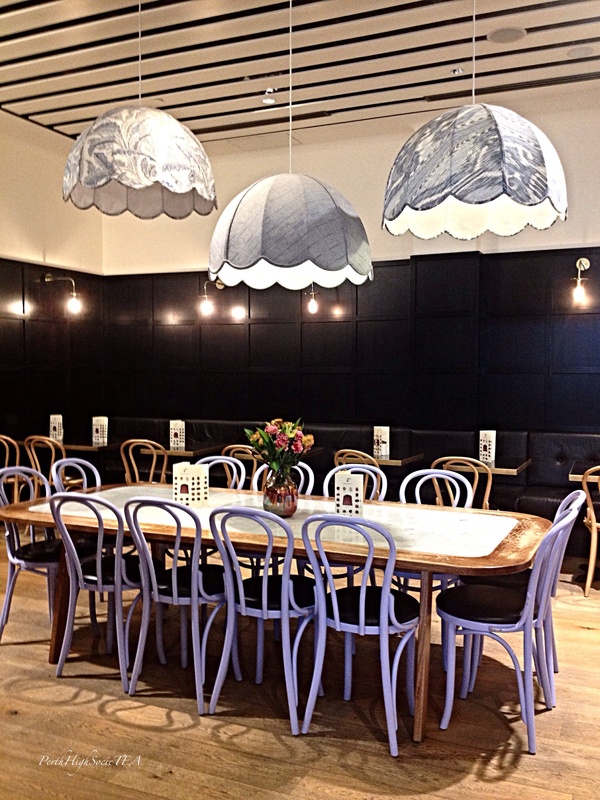 JP Sancho is located on Hay Street in the heart of the Perth CBD. It’s a cute French bakery that doubles as a cafe, with a gorgeous little seating area that reminded me of the lounge room in my childhood home. With its beautiful decorative ceilings, chandeliers, mirrors, polished tables and even a grandfather clock, the decor gives the bakery a really warm and cozy feel, and for me it was quite nostalgic. Our table wasn’t overly decorative, in fact it was quite simple. The white crockery and serviettes both feature the JP Sancho logo, which is a nice personalised touch. I felt that the simplicity of the teaware matched accordingly with the interior decor of the seating area. I don’t think floral teaware would suit this venue. I felt that the service at JP Sancho was somewhat lacklustre. 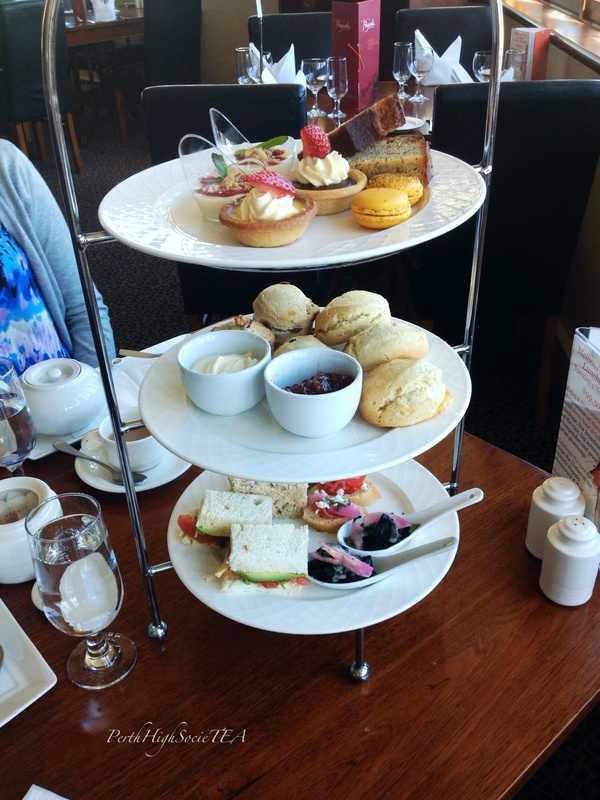 When my girlfriend and I arrived we were promptly seated and given a high tea menu each. 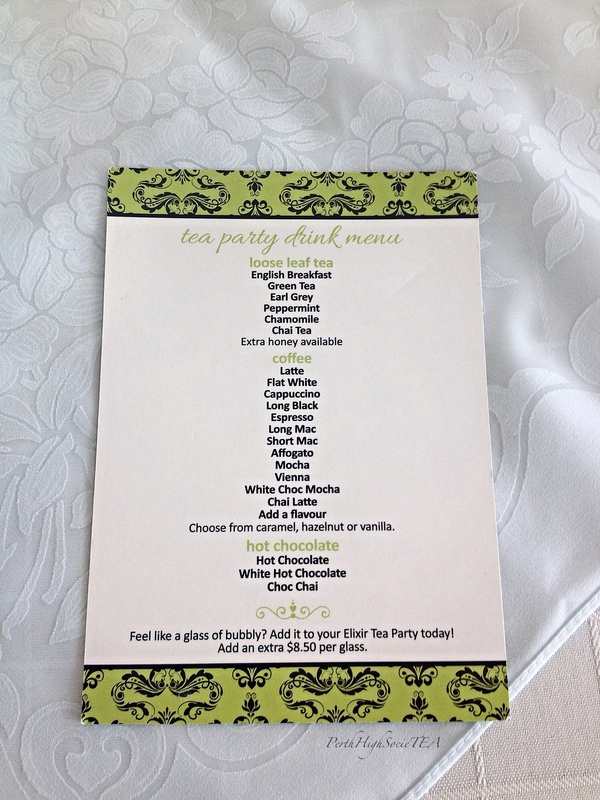 As a food blogger I always appreciate being handed a high tea menu in case I forget something. The host came back shortly and took our tea order. We saw him a second time when he arrived with our three-tier stand, and a final time when he came back with our tea. There was virtually no verbal communication, and it was only when we got up to pay that we were asked if we enjoyed everything. I know most people wouldn’t see this as an issue, and I’m not saying that the service was in any way terrible, I just would have preferred a little more attention, and perhaps another pot of tea 🙂 I think it’s the little things that can really make a difference in hospitality. We were offered a nice selection of teas to choose from. I decided to stay safe and go for my usual English breakfast while my girlfriend opted for a pot of earl grey. When our three-tier stand arrived, I was complete awe of the beautiful presentation. 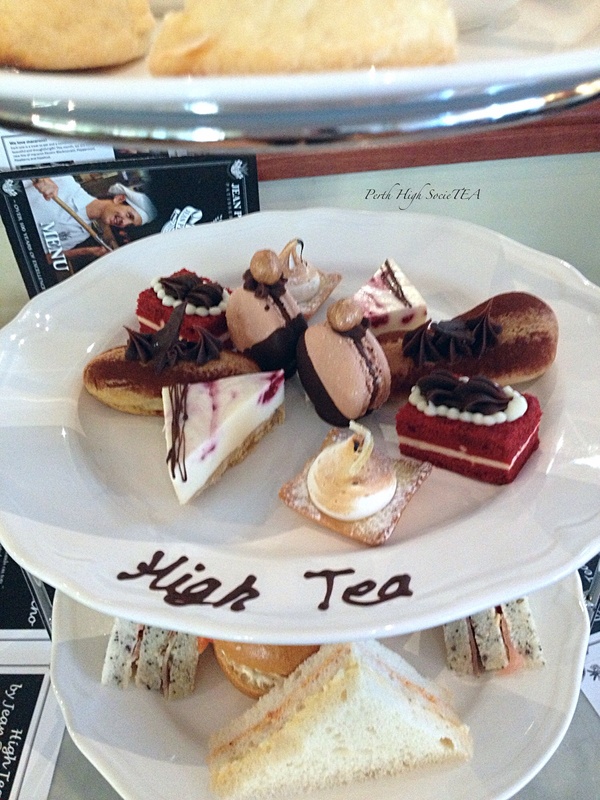 On the sweets tier, the words “High Tea” were written in chocolate, and I thought that this was such a fantastic and unique touch. Like always, the sandwiches were the first to be consumed. The sandwiches were quite large, and my girlfriend and I received two each. My vegetarian variety consisted of egg mayonnaise with sun-dried tomato. The bread was nice and soft, exactly how it should be, however I think we both would have preferred if they were a tad smaller in size. My friend received two sandwiches with roast beef, horseradish cream and tomato on cereal bread, she liked the filling but felt that the bread was a bit on the dry side. In addition to sandwiches, my friend also received two mini brioche with smoked salmon, baby spinach and dill. Unfortunately she didn’t particularly enjoy the filling, and I was left wondering why I didn’t receive a mini brioche with a vegetarian filling. I also thought that being a bakery, there would at least be a tart or a quiche on the savoury tier. My girlfriend and I received four plain scones topped with almonds. These scones were an absolute delight. They were fresh, light and fluffy on the inside, and smooth on the outside. They tasted amazing accompanied with the strawberry jam and clotted cream; in fact they reminded me of the perfect scones that I had at The Ritz hotel in London. 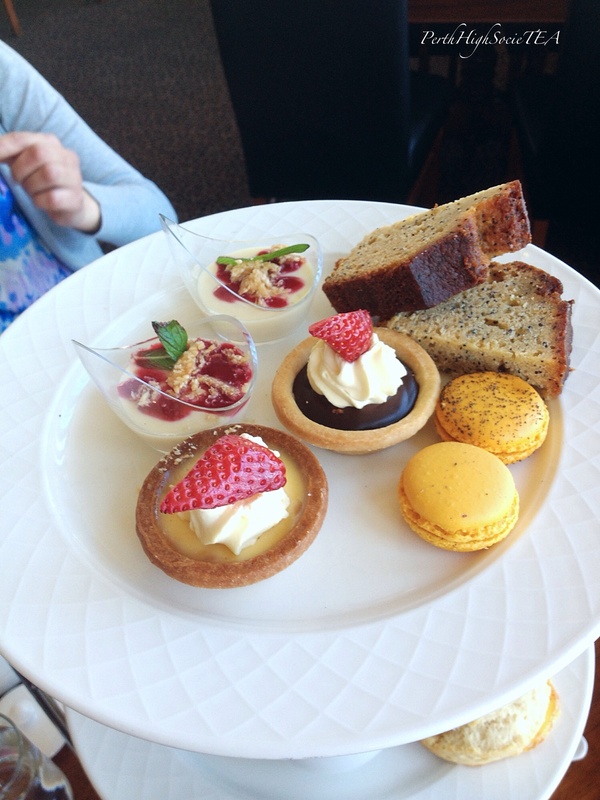 The sweets tier was the highlight of this high tea experience. I couldn’t fault any of the goodies on this tier. There was a variety of sweets to choose from: lemon meringue tarts, chocolate choux, red velvet cakes, chocolate covered macarons, and raspberry cheesecakes. I enjoyed every single one, and the best part was that we received two of each, so we didn’t have to worry about halving anything. Red Velvet Cake – Yum! The ambience of the cafe area was pleasant, and being a week day it wasn’t overly busy either. I really enjoyed the food, however I would have liked to have seen more vegetarian options. 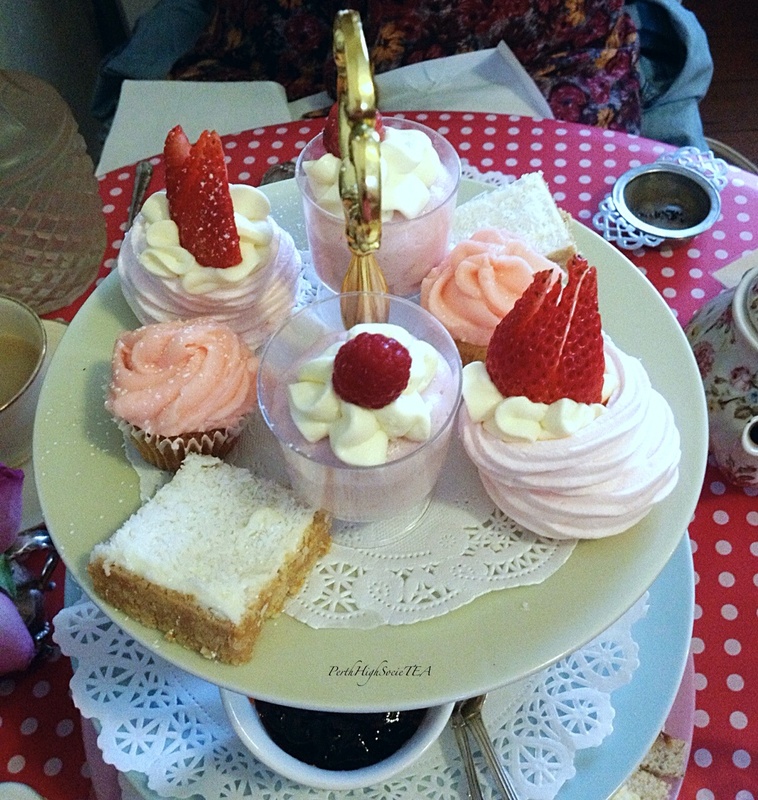 I loved the sweets tier, and the scones were perfect. 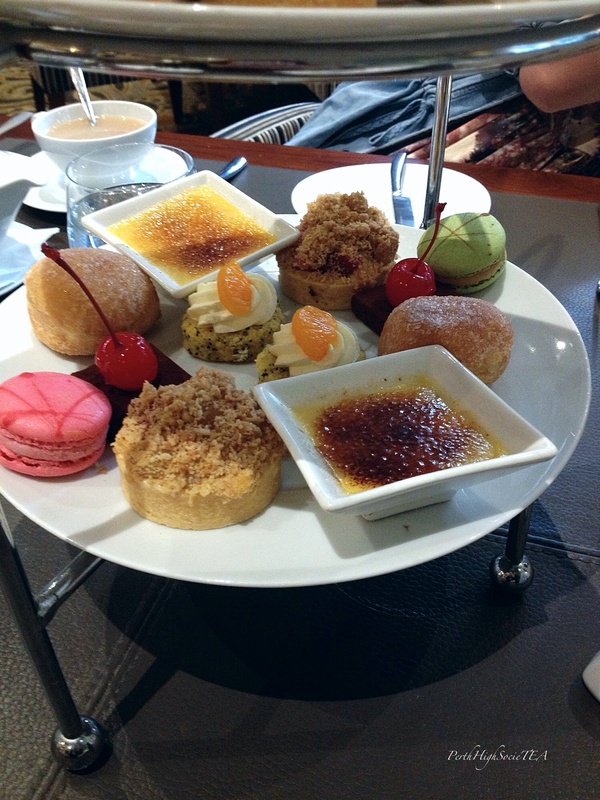 I was really impressed, especially considering that they have only recently started offering high tea. 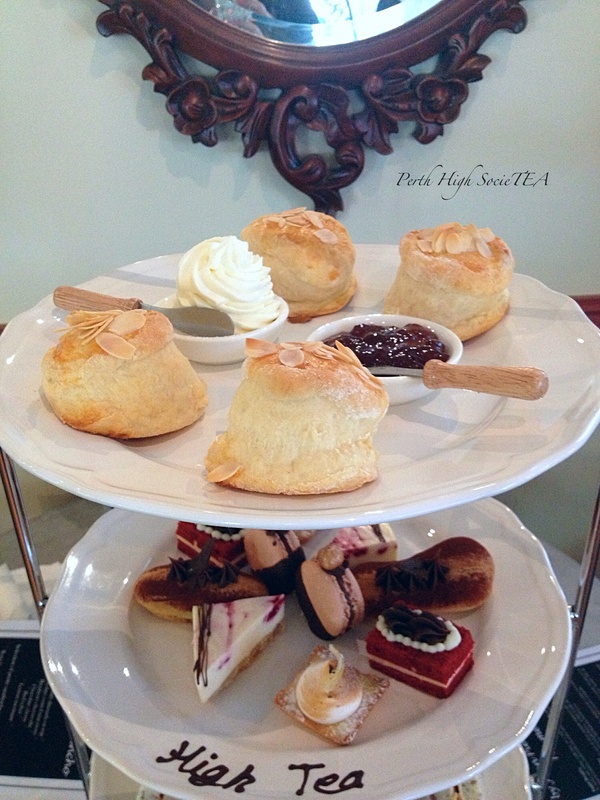 With a few minor tweaks mostly related to the quality of service, JP Sancho has the potential to be a total stand out, and has already found a place in my top three Perth high tea venues. In late May I arrived in London to visit my partner who is currently based here on a short term work-related transfer. This is my first international voyage, and has so far been an experience that has evoked many different emotions for me. I must admit that the long haul flight from Australia wasn’t particularly thrilling, however I am excited to be embarking on a new experience, and even more excited about enjoying high tea in the afternoon tea capital of the world- London! 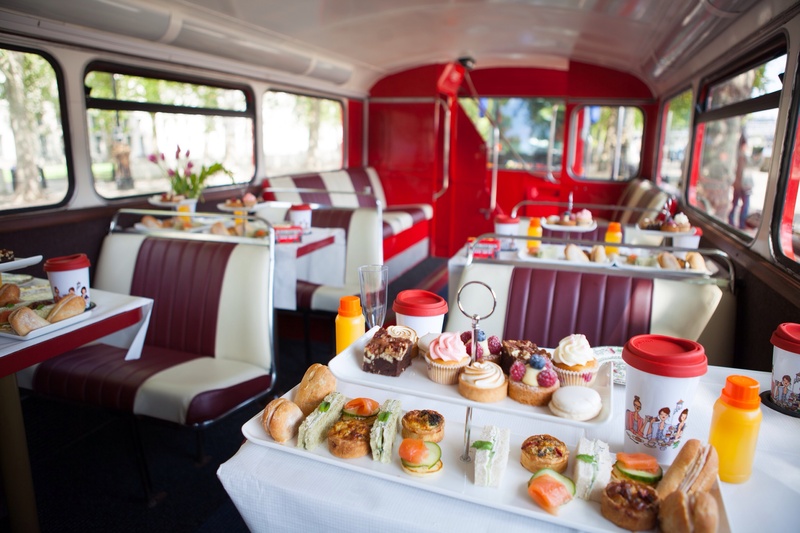 In April, the BB Bakery in Covent Garden began offering their usual afternoon tea on board an iconic red double-decker bus. The bus takes guests for a tour around London’s most popular tourist attractions. 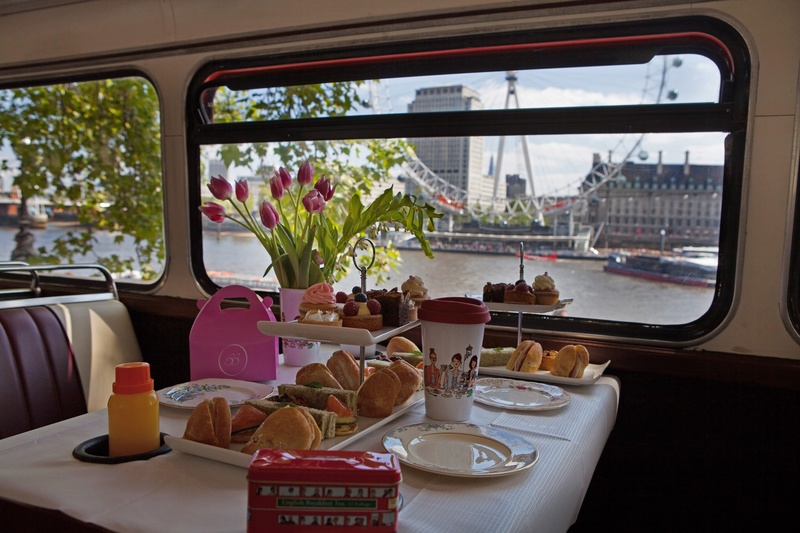 As a first time traveller to London and a lover of afternoon tea, as soon as I saw this advertised I booked it straight away. 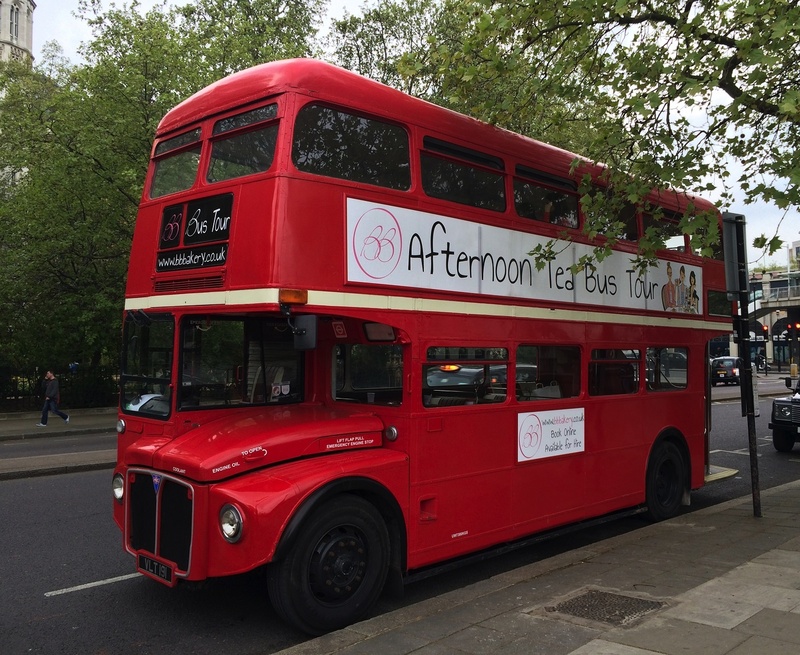 I couldn’t think of a better way to view the sights of London then to do it on board a double decker bus, all the while enjoying the delightful afternoon tea treats that the BB bakery has to offer. The inside of the tour bus is stunning. There are these gorgeous red and white booths, and the tables are decked out with scrumptious looking afternoon tea treats. Each person had a beautiful little china plate to put their food on. However for safety reasons, the amount of crockery available is limited. The host was a delightful Frenchman by the name of Jean-Philippe. He was very friendly, jovial and accommodated the requests of all guests on board. Before the tour commenced, Jean-Philippe welcomed all guests on board the bus and provided us with a description of the food that was on offer before promptly taking our tea and coffee orders. He also joking informed us that at any time we could request for the driver to slow down. I was offered the vegetarian afternoon tea, while my partner enjoyed the classic non vegetarian option. Staff remembered my dietary requirements and there were no issues, which is something that I always appreciate. There are also gluten free and vegan options available. The food looked deliciously appetising, and it was beautifully presented. It tasted superb and you could tell that it was 100% freshly prepared. My guess is that it probably came straight from their flagship bakery in Covent Garden. My vegetarian savoury tier included: a cream cheese sandwich, a vegetarian quiche (which was absolutely amazing!) a cheese sandwich, a cheese and salad sandwich and a cheese and salad blini. My partner received a cream cheese sandwich, two ham and cheese sandwiches, a salmon blini, and a quiche. The bread had a beautiful freshly baked smell to it, and the fillings were ample. The sweets tier included: a pecan brownie, a mouth watering petite lemon meringue tart, cupcakes (mine had strawberry frosting), a lemon macaron, a fresh berry fruit tart and a French scone. The French scone was interesting. It reminded me more of a sticky bun, and there was no jam or clotted cream to accompany the scone, which made it difficult to eat. I would have preferred the option to spread some fruit preserve and cream on it and eat it like a traditional scone. However, this is a minor criticism as the food was essentially faultless. You are given an ample amount of food and I can guarantee that you won’t be leaving hungry. In fact, after working our way through the two tier stand, Jean-Philippe came around and offered us more food. This is when we received our French scone and a lemon flavoured macaron. At the end of the tour we were given a gorgeous pink take away box for any food that we didn’t manage to fit in. Drinks were served in these gorgeous BB bakery travel mugs, and were a fabulous idea. There are also cup holders in the booth tables, and we were each given a small bottle of freshly squeezed orange juice at the beginning of the tour. The last thing you want is to be drinking tea from a tea cup and saucer and having it spill everywhere while the bus is moving! 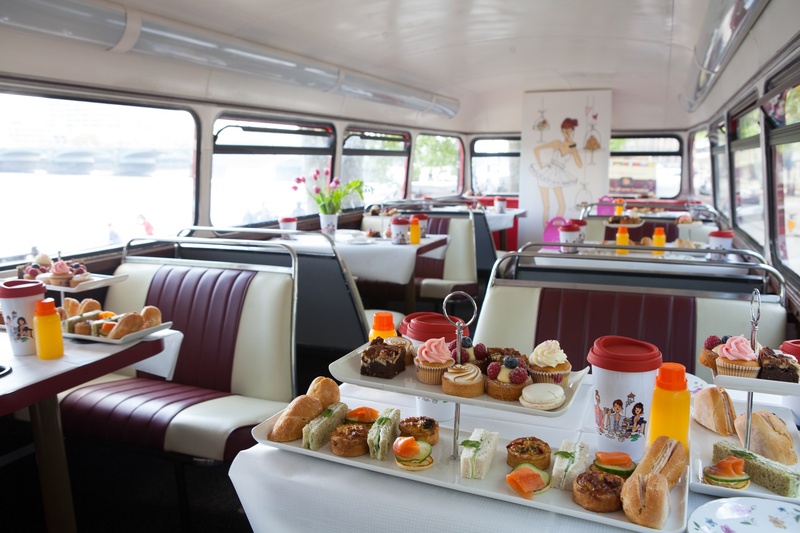 Initially, the thought of having afternoon tea on a moving vehicle without seatbelt restraints seemed daunting, however the BB Bakery were well and truly prepared when they began running this bus tour service. I absolutely recommend this tour to anyone travelling to London. Even if you are only planning a short trip, this is the best way to enjoy what London has to offer. In an hour and a half, you get to indulge in some scrumptious and freshly prepared sweet and savoury treats from a popular UK bakery, while checking out some the most popular tourist attractions in London. 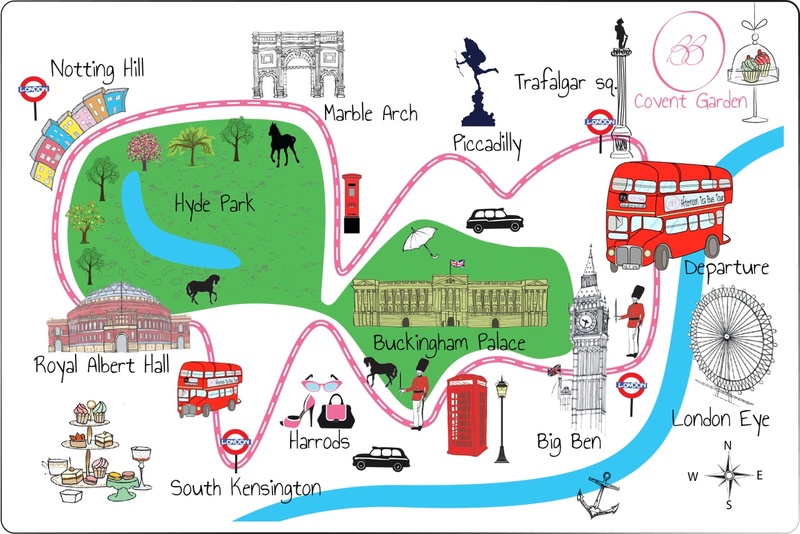 Below is a tour map; and as you can see, the bus tour takes guests around the most popular tourist attractions in London Town. I was absolutely impressed with the venue, the food, the service, and the overall experience of the BB Bakery bus afternoon tea tour. I highly recommend this tour to travellers, or even to locals looking for a great way to celebrate a friend’s birthday, or for a fun afternoon out. The experience has definitely been one of the highlights of my trip to London thus far. Special thanks to the BB Bakery for allowing me to use their beautiful photographs. For the purposes of this review, poor iPhone quality images just won’t do! The BB Bakery Bus Tour runs twice a day from Monday to Friday at 3pm and 5:30pm. On weekends the tour runs three times a day at 12:30pm, 3pm and 5:30pm. Afternoon Tea is priced at £45 per person.